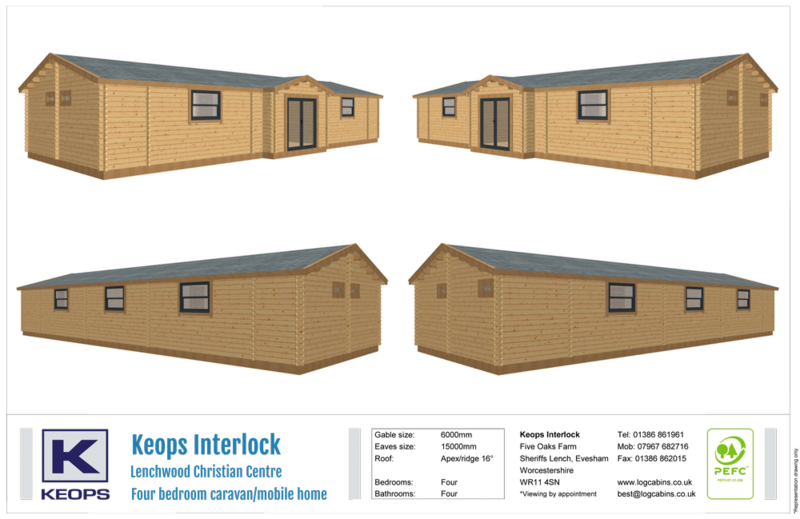 We are delighted to be involved in a very exciting new project for Lenchwood Christian Centre near Evesham. 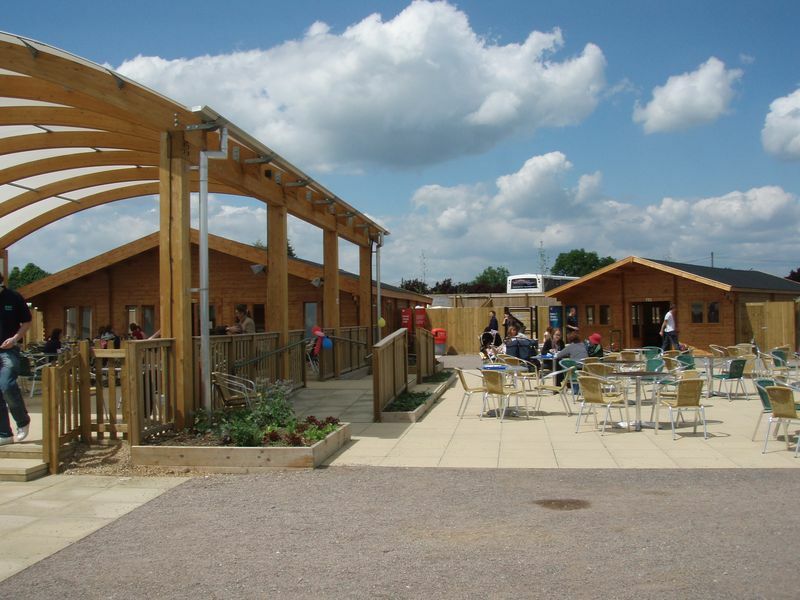 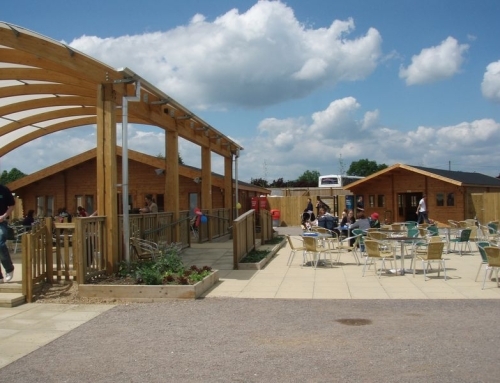 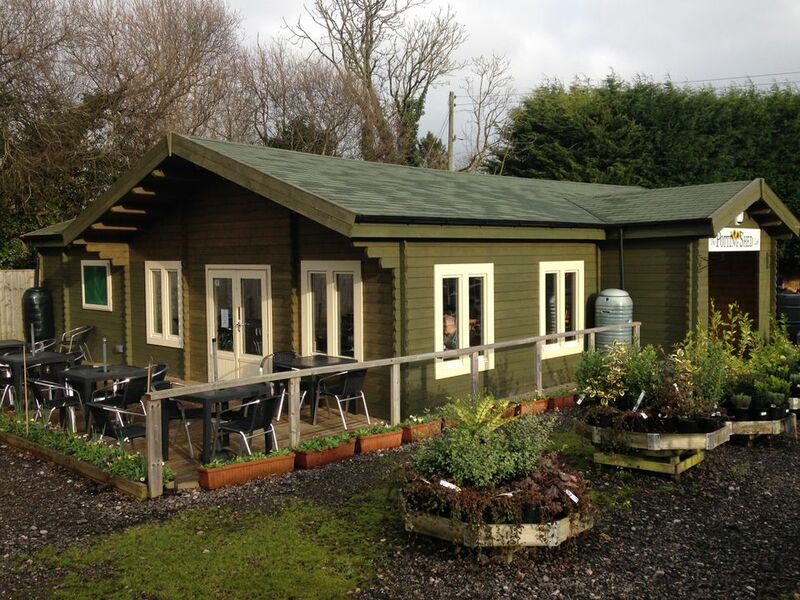 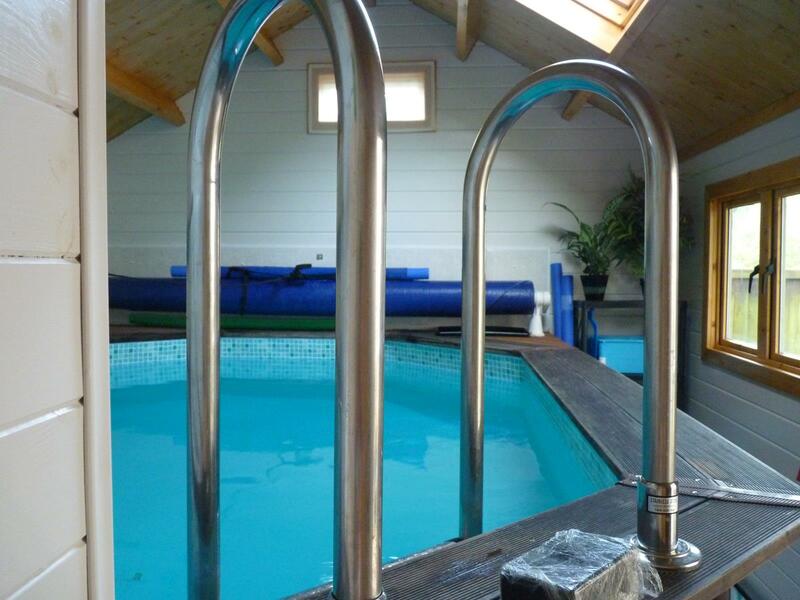 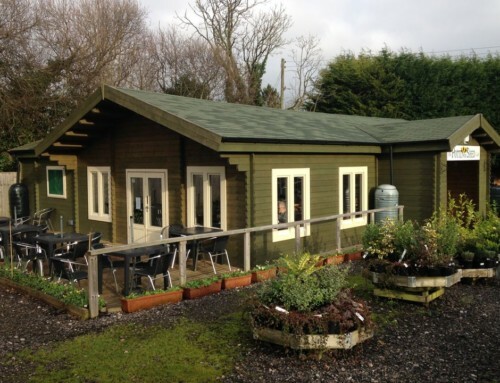 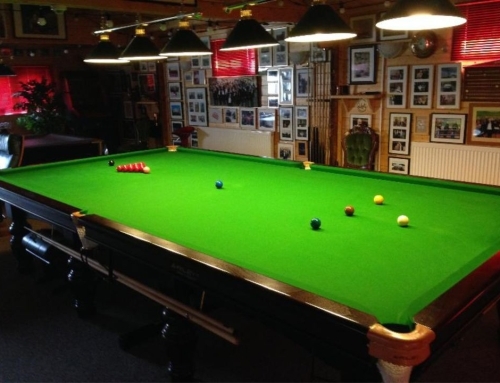 Situated in beautiful Worcestershire countryside, the centre is an ideal location for events, camping weeks or weekends away for churches, youth and other groups. 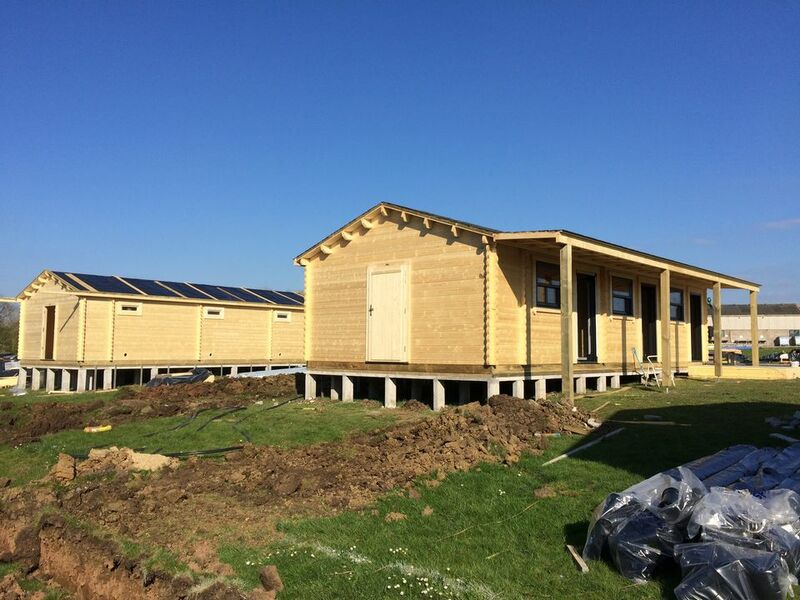 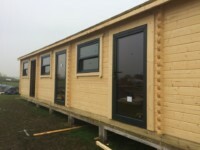 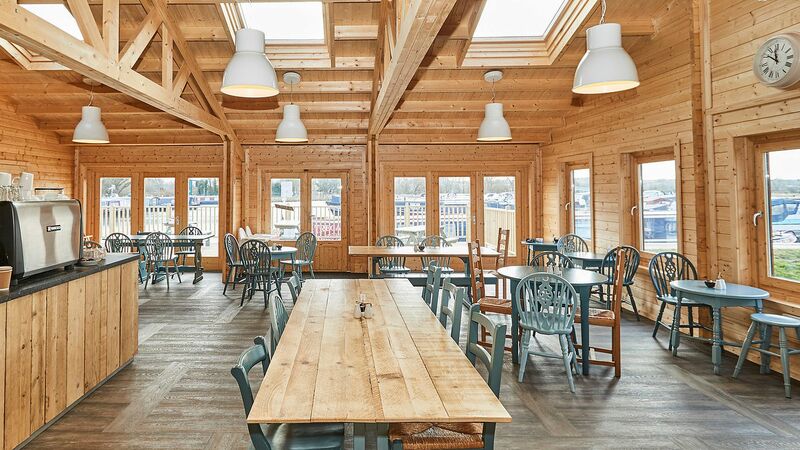 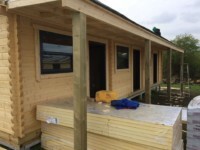 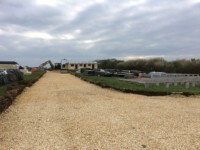 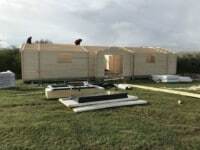 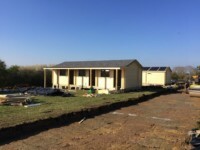 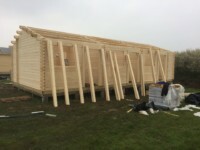 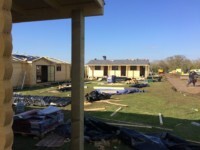 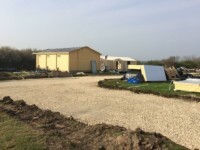 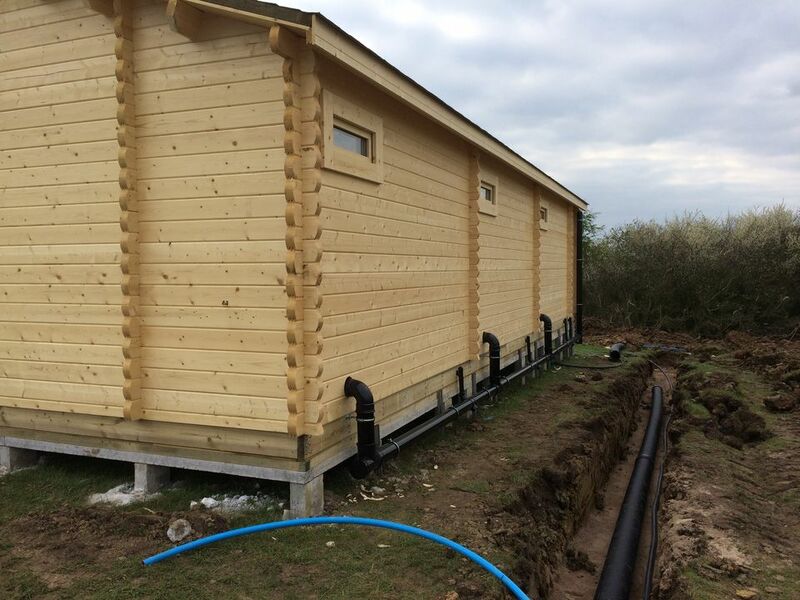 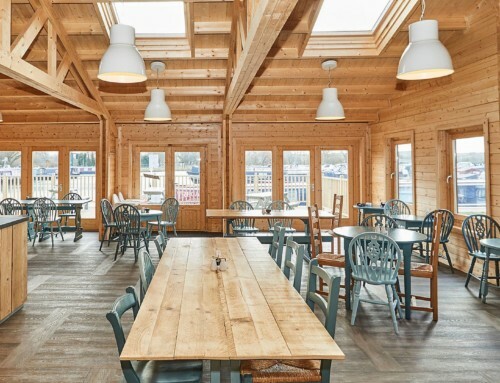 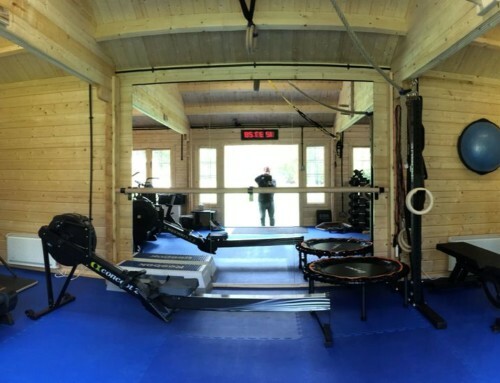 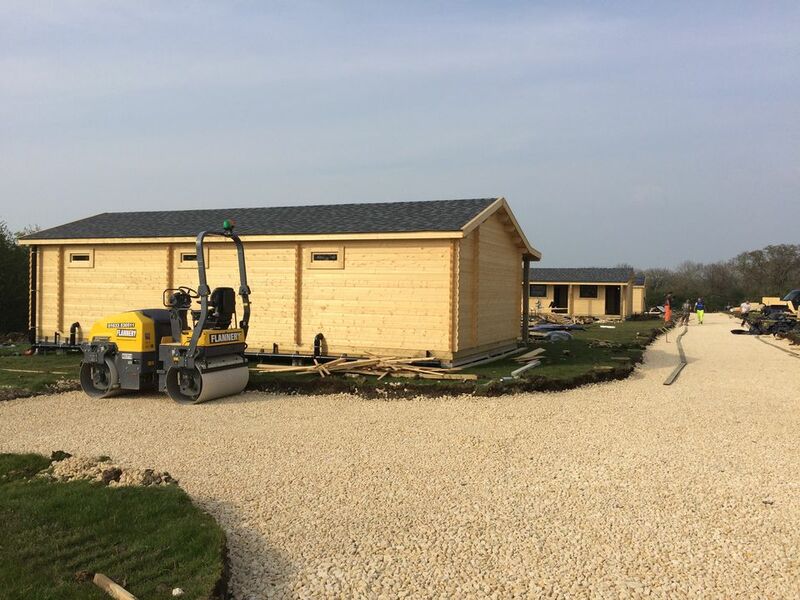 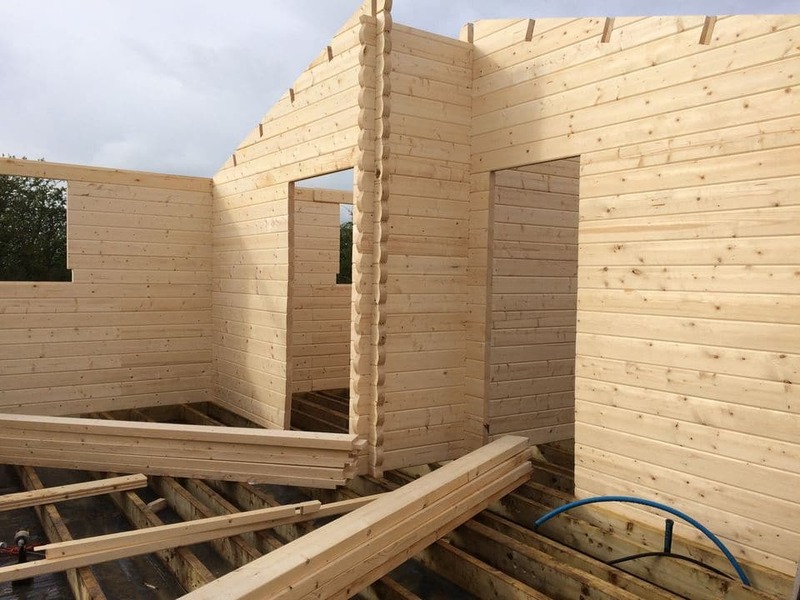 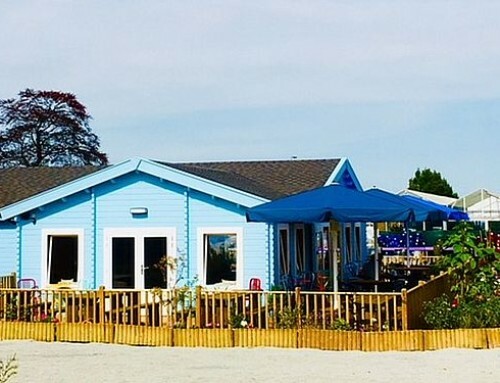 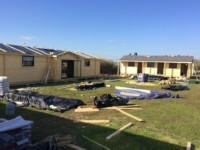 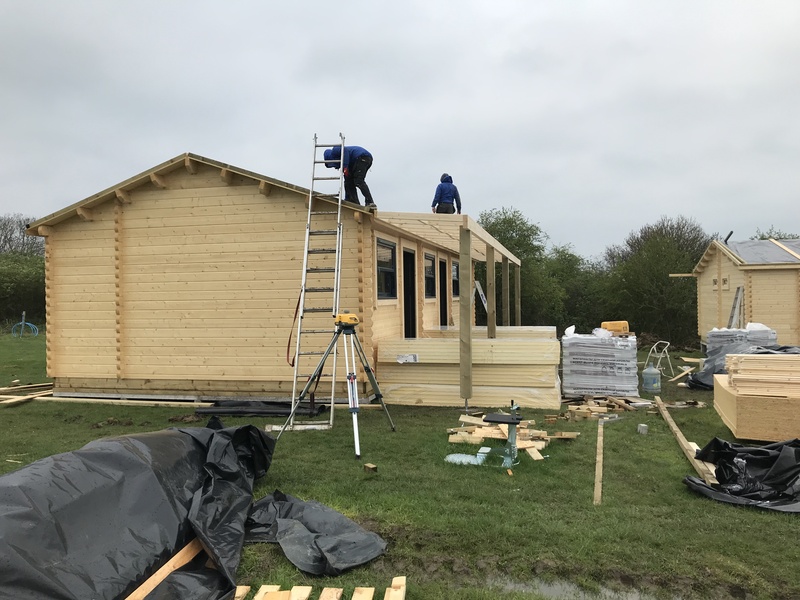 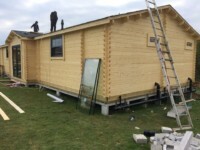 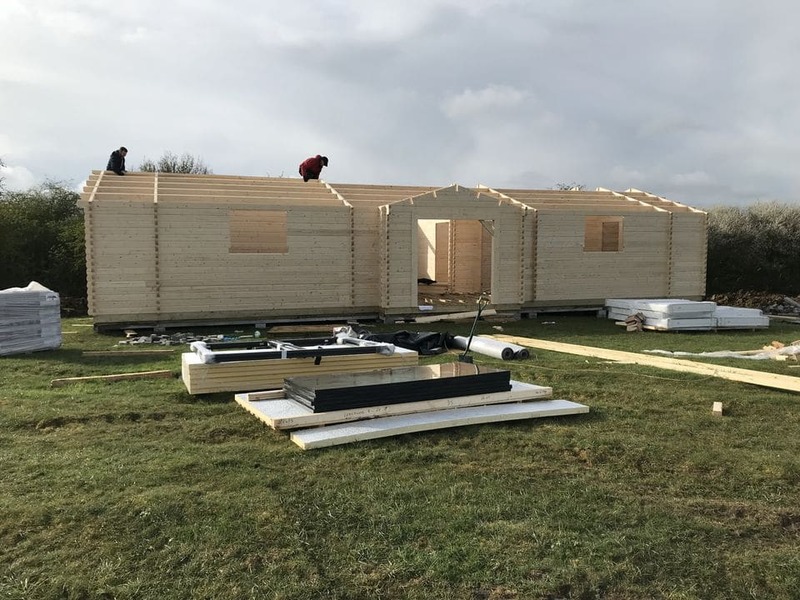 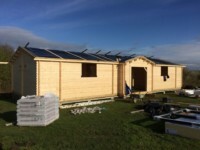 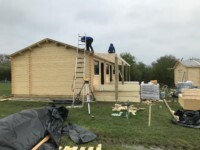 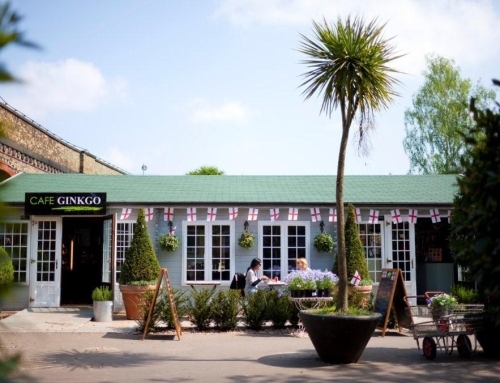 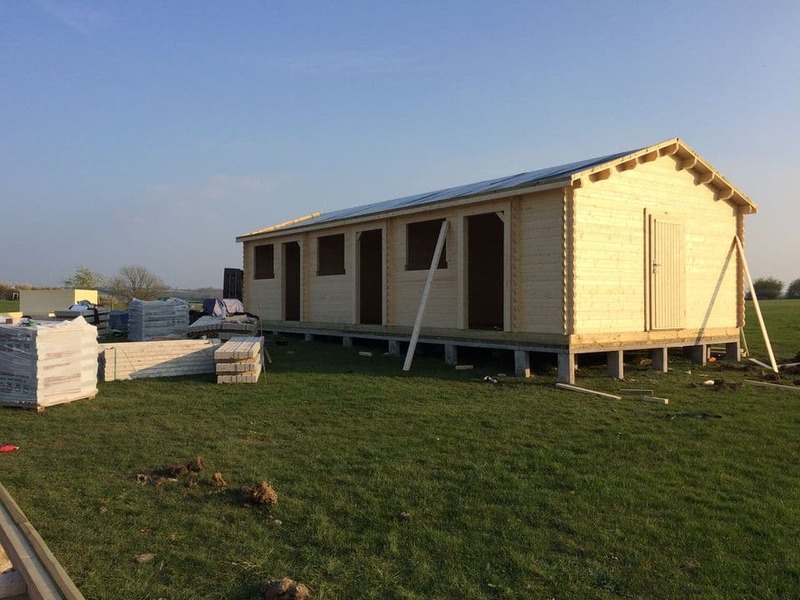 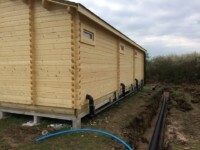 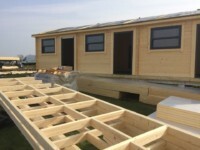 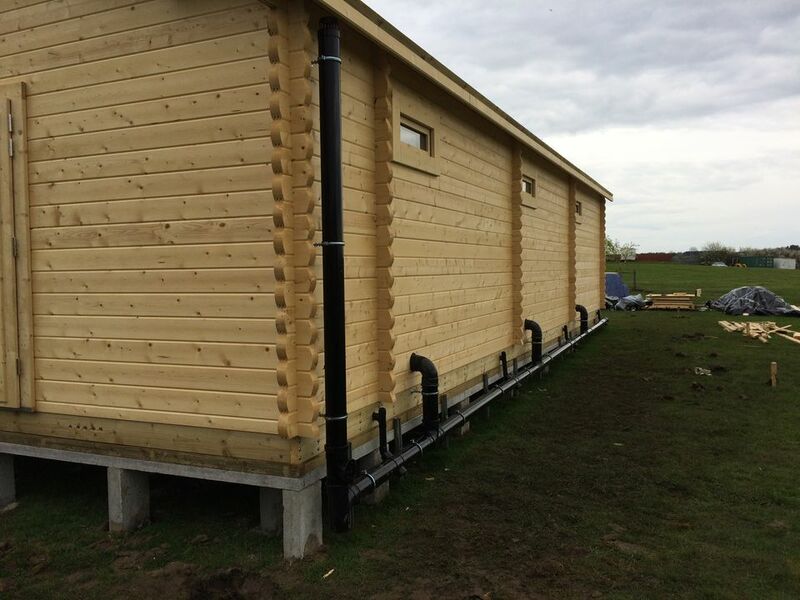 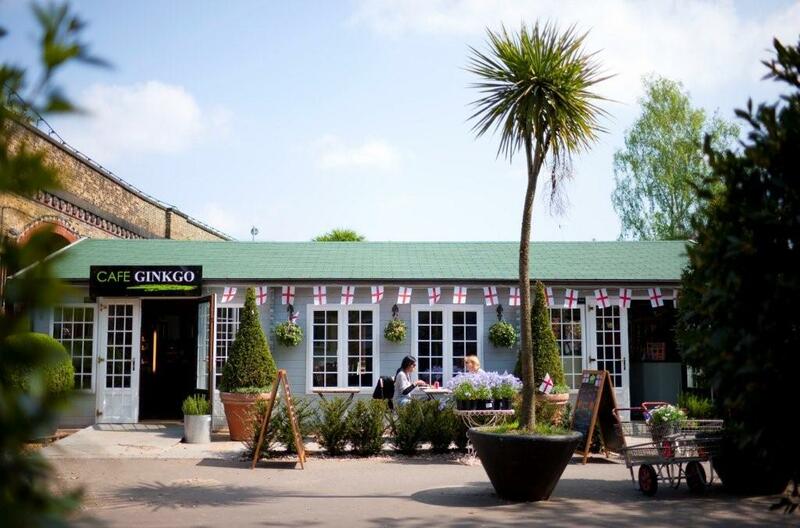 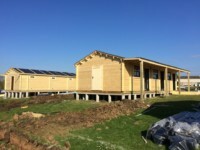 To add to the existing event and conference accommodation, the new development will include seven log cabin mobile homes, each with three or four bedrooms. 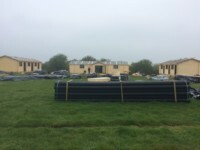 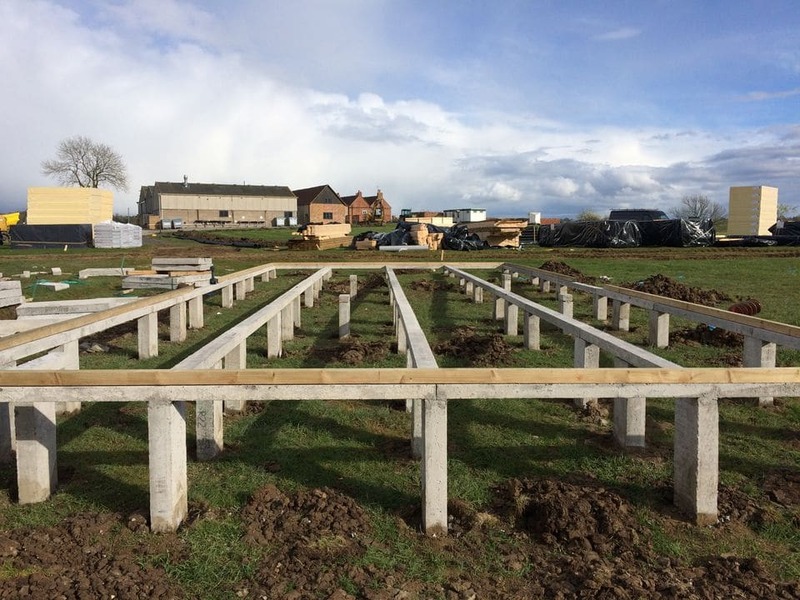 Set out in a double horse shoe layout with fantastic views over the surrounding countryside, the double and twin bedrooms will have their own en-suite bathroom with shower facilities. 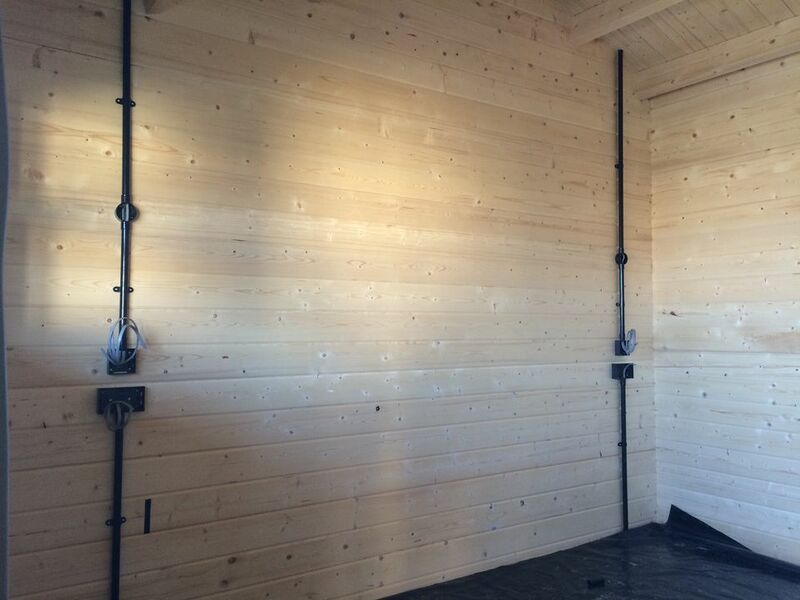 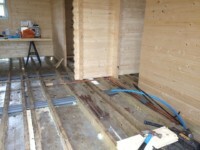 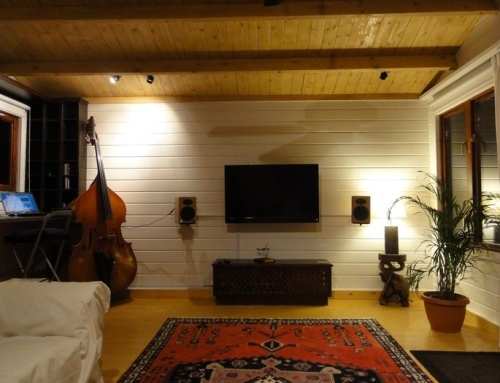 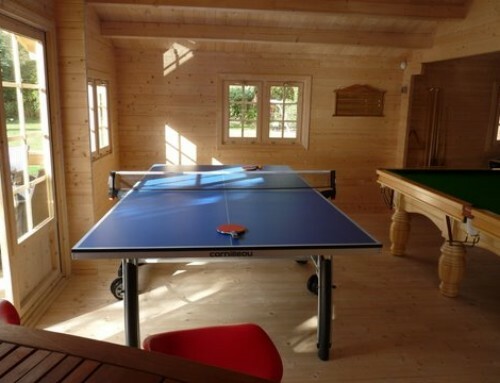 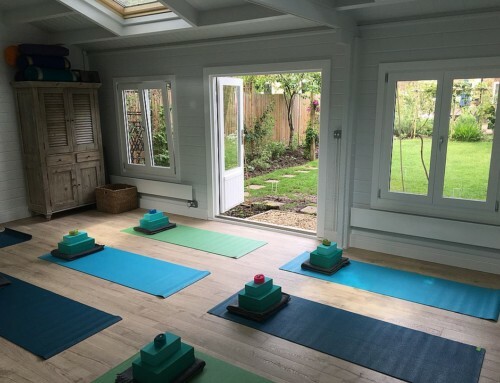 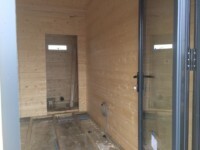 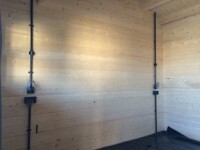 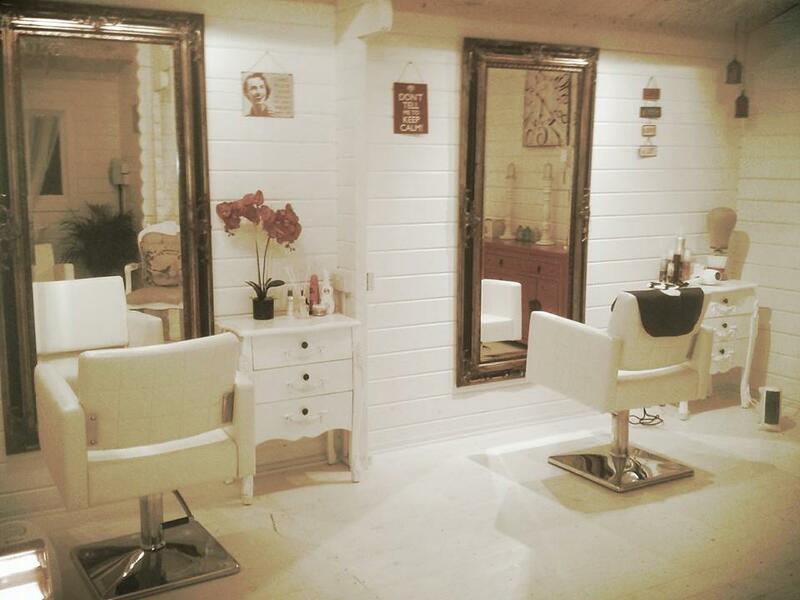 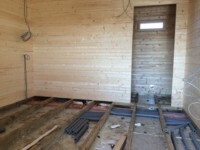 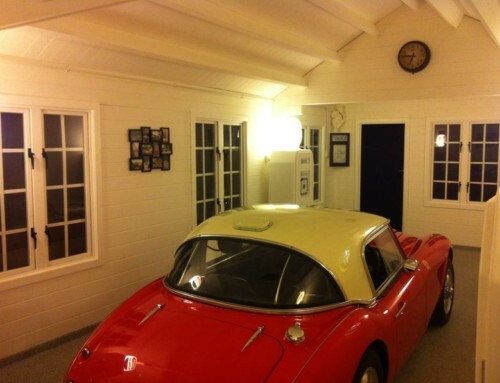 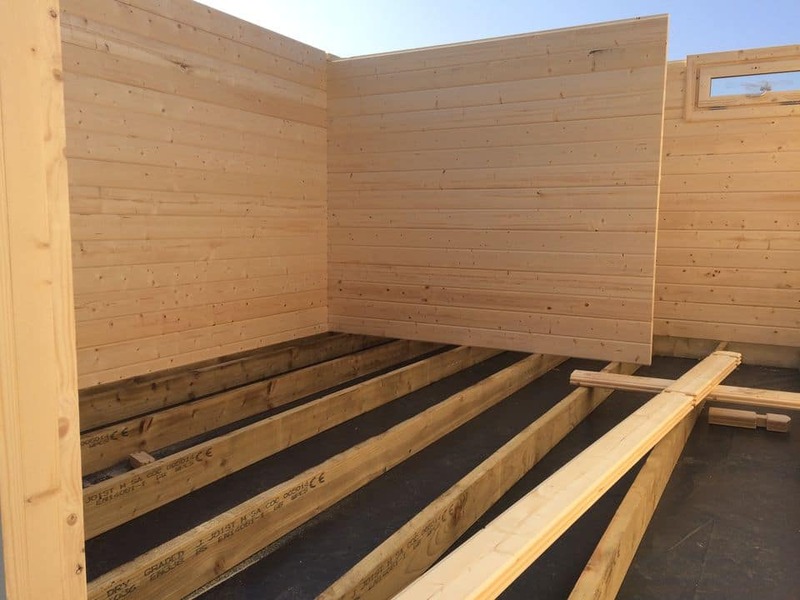 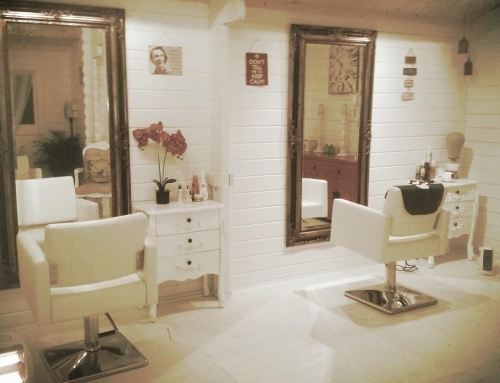 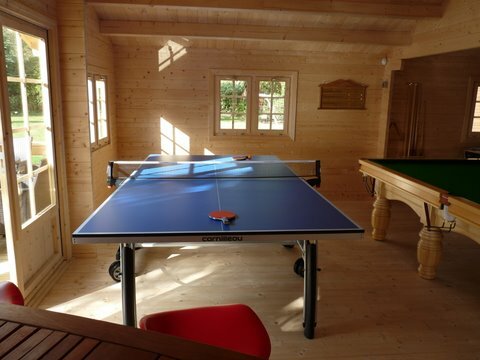 Pine wooden floors are laid in cabin 1 and covered with plastic to keep clean! 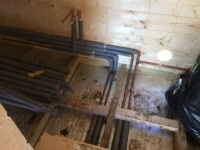 Plumbing and electric works are progressing well. 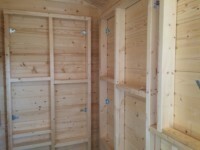 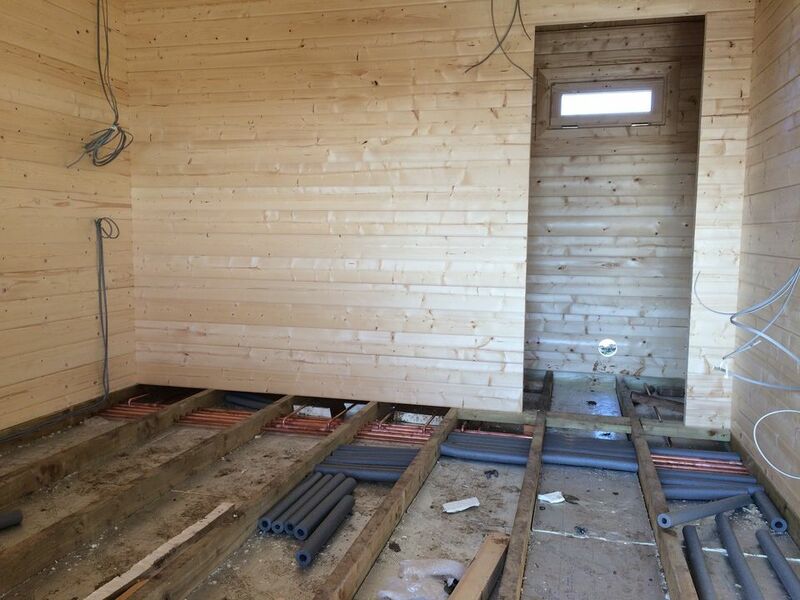 The roof insulation has been fitted to cabin 2 and boarded ready for the shingles to go on top. More trenches for services have been dug. 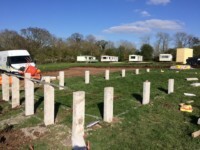 Base 6 is finished. 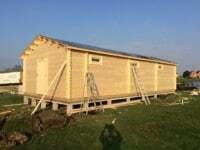 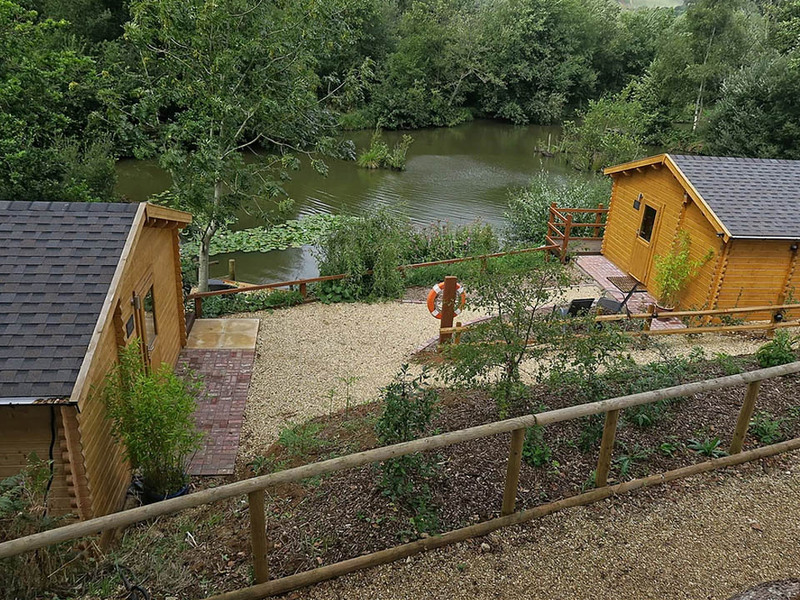 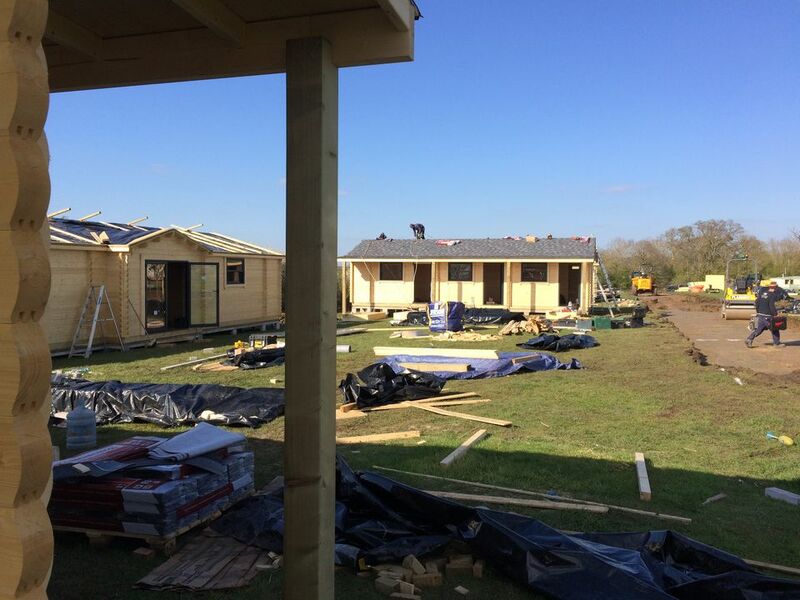 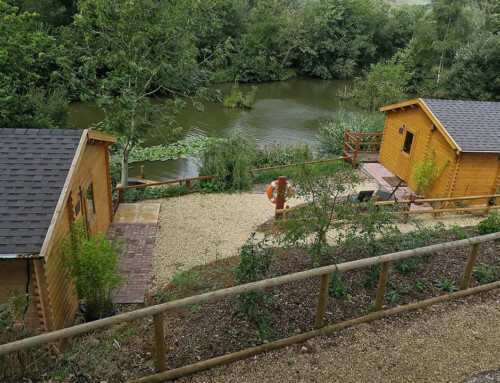 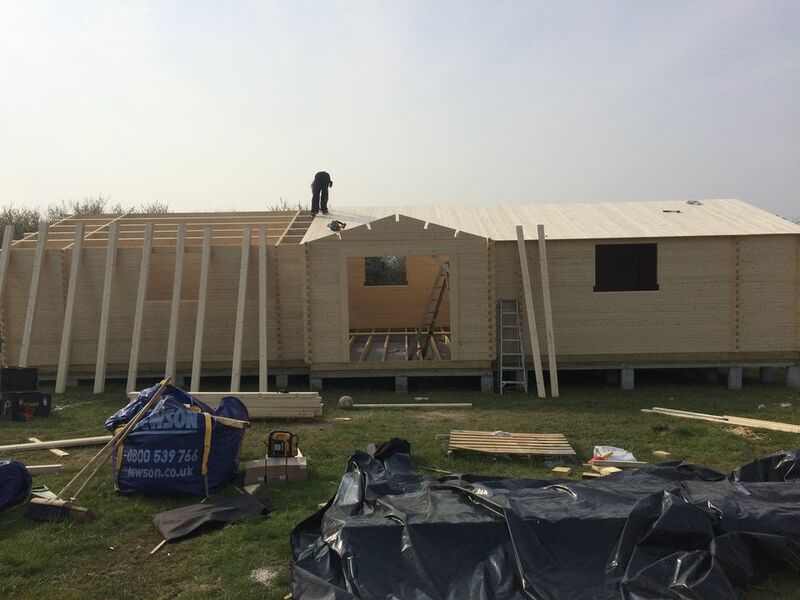 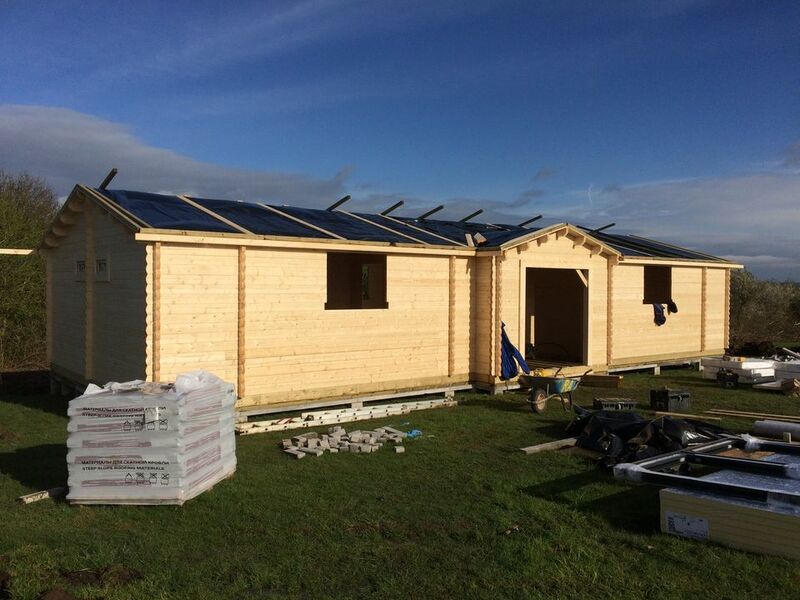 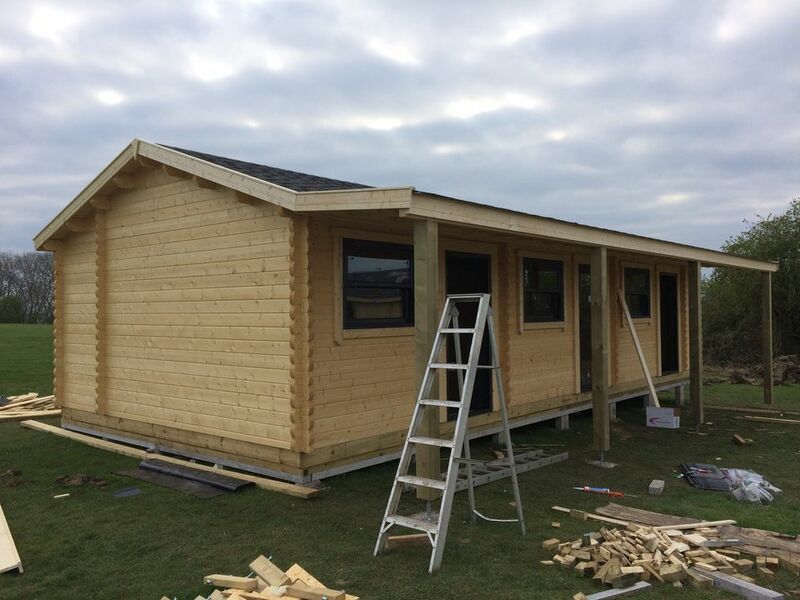 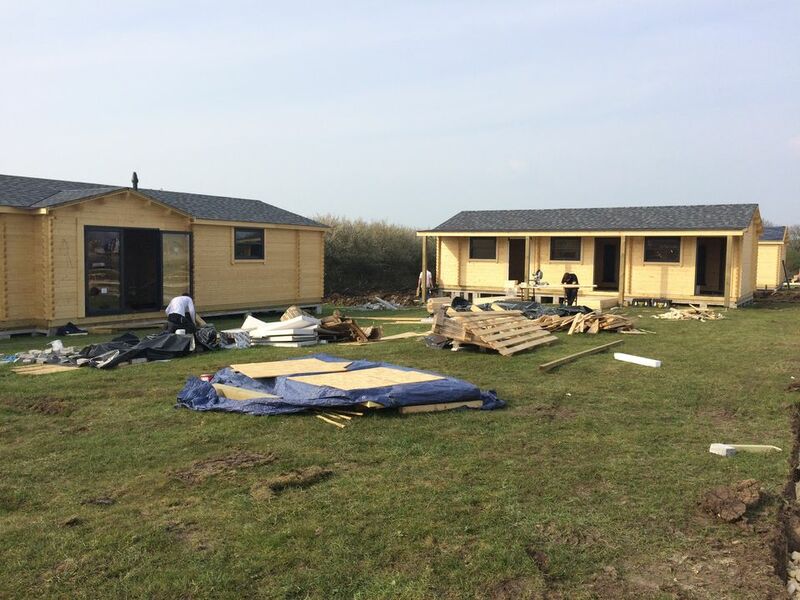 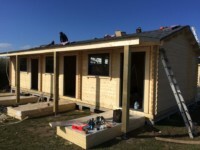 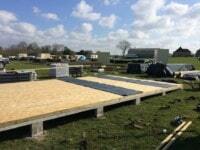 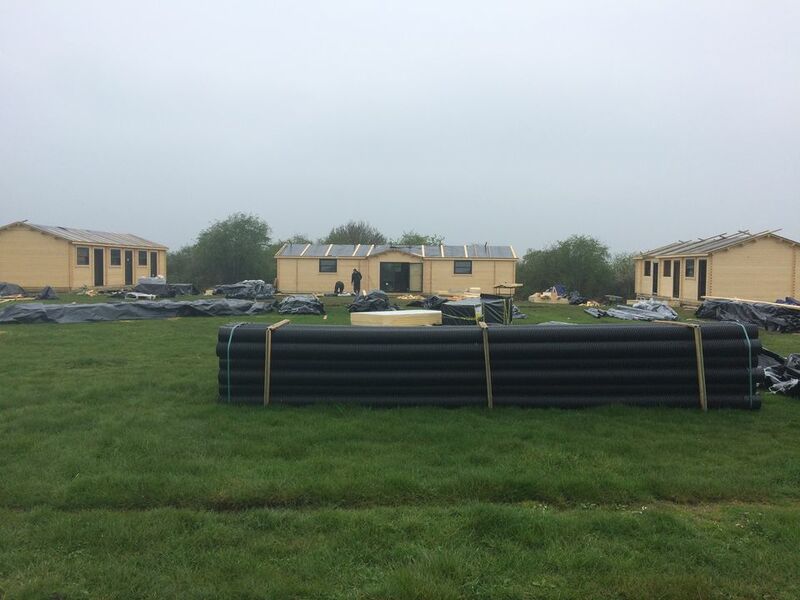 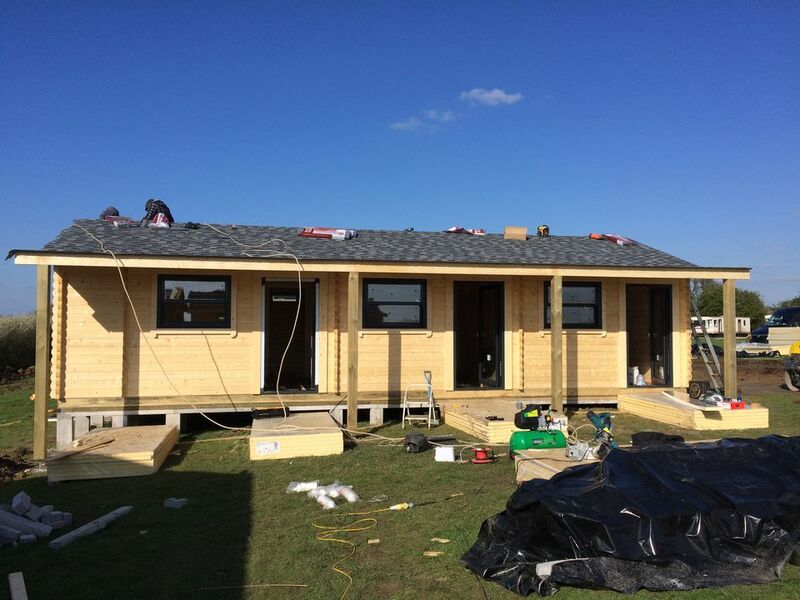 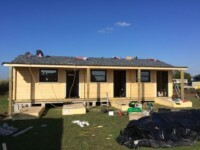 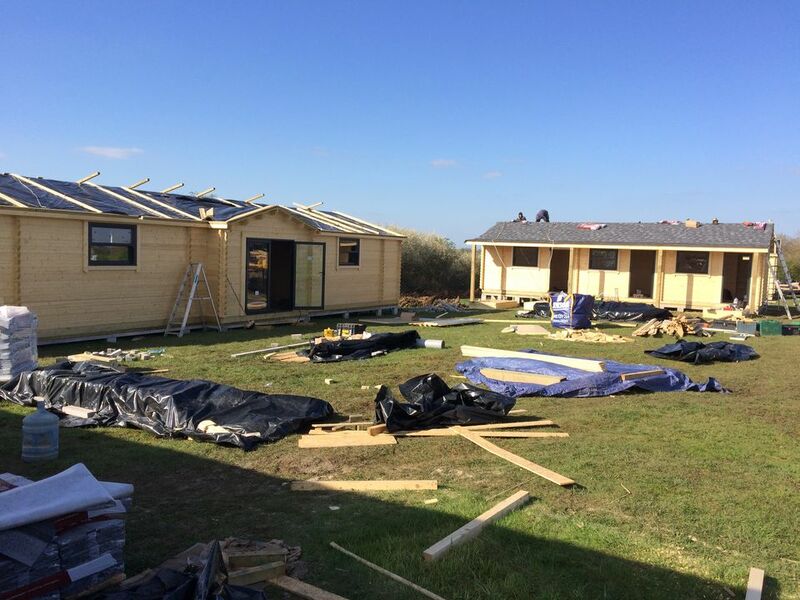 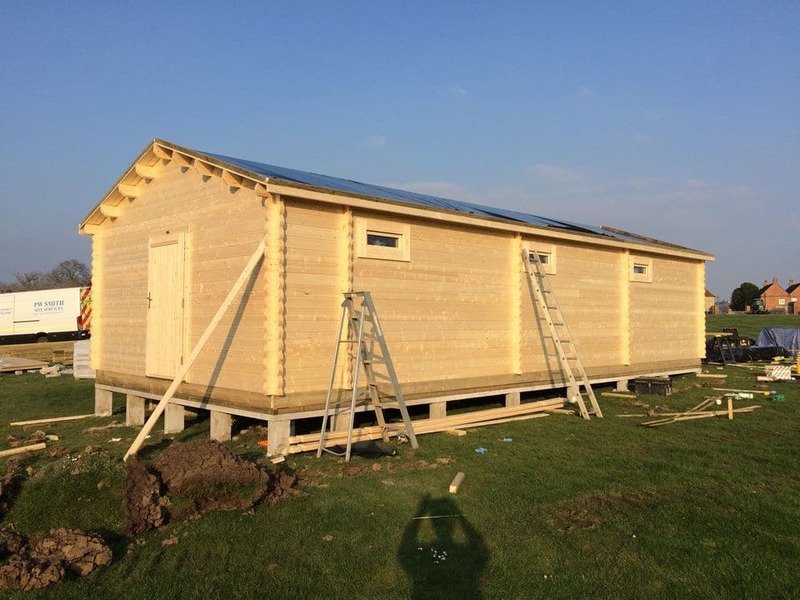 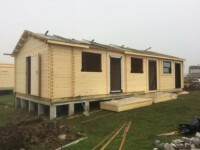 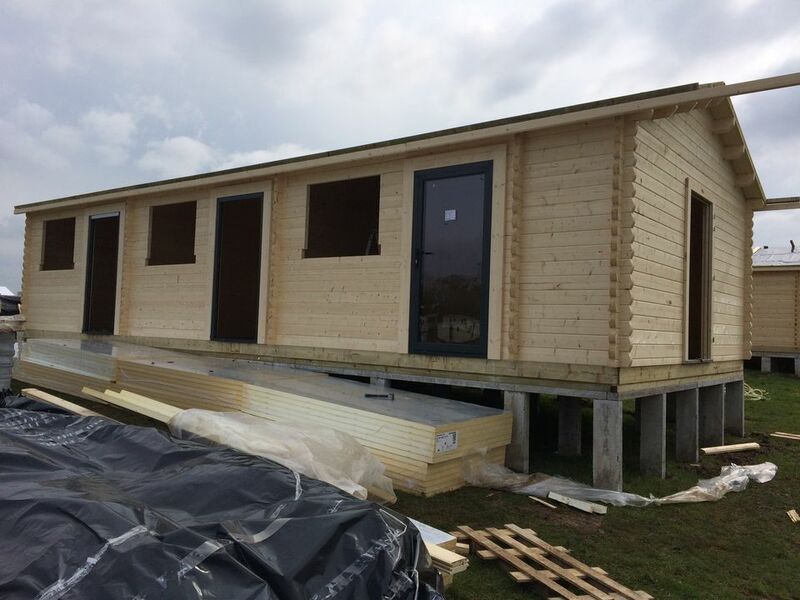 Roof shingles are fitted to cabins 1 & 3 now the canopies and posts have been completed. 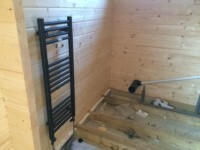 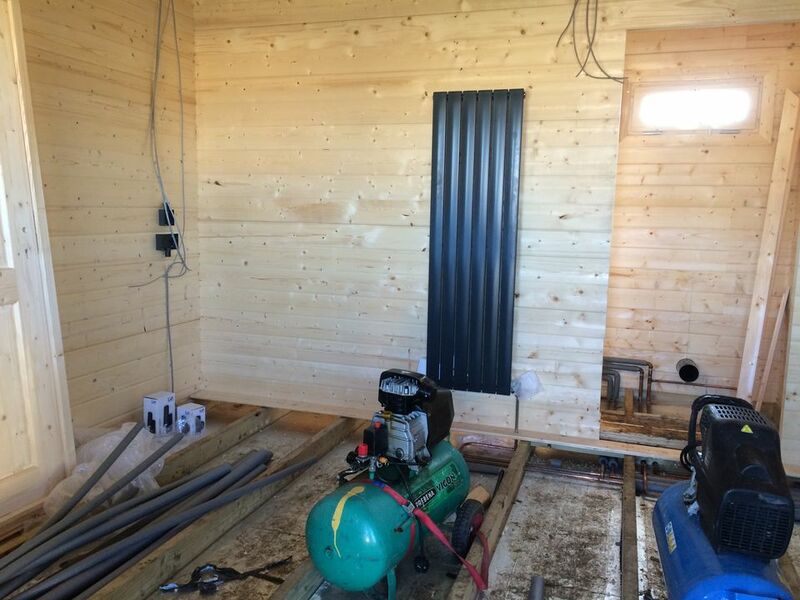 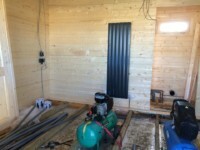 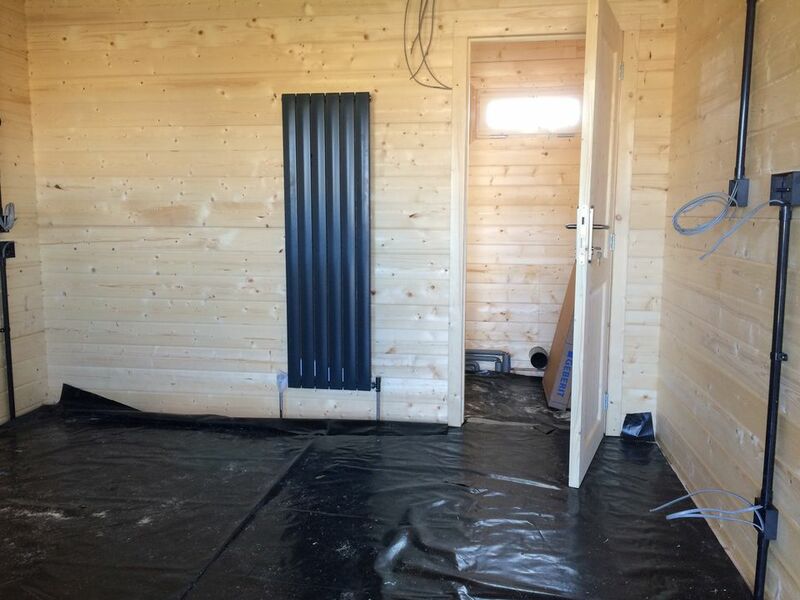 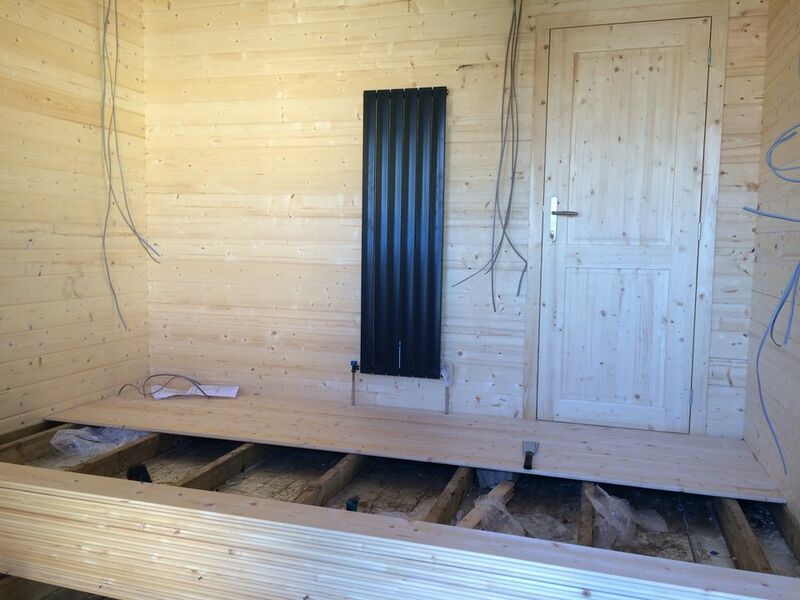 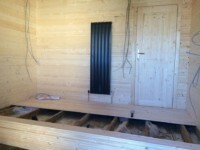 Radiators have been installed in the bedrooms of cabin 1. 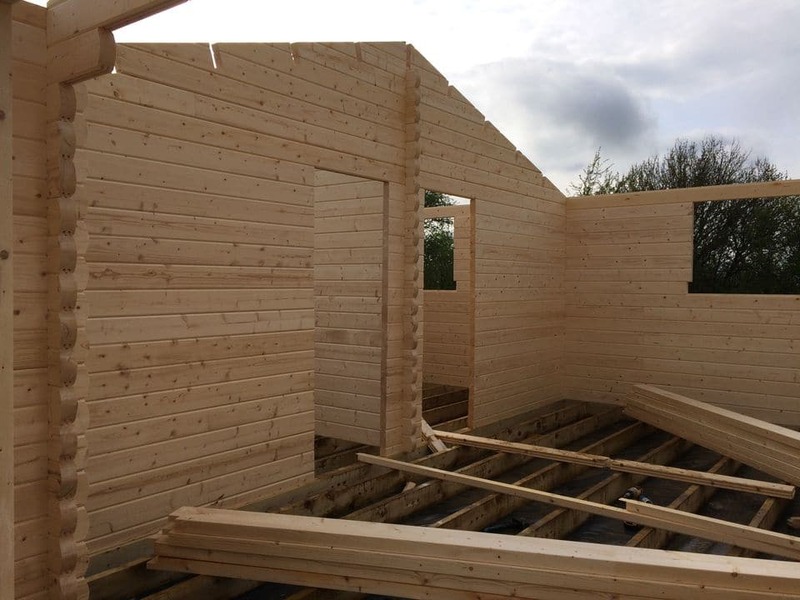 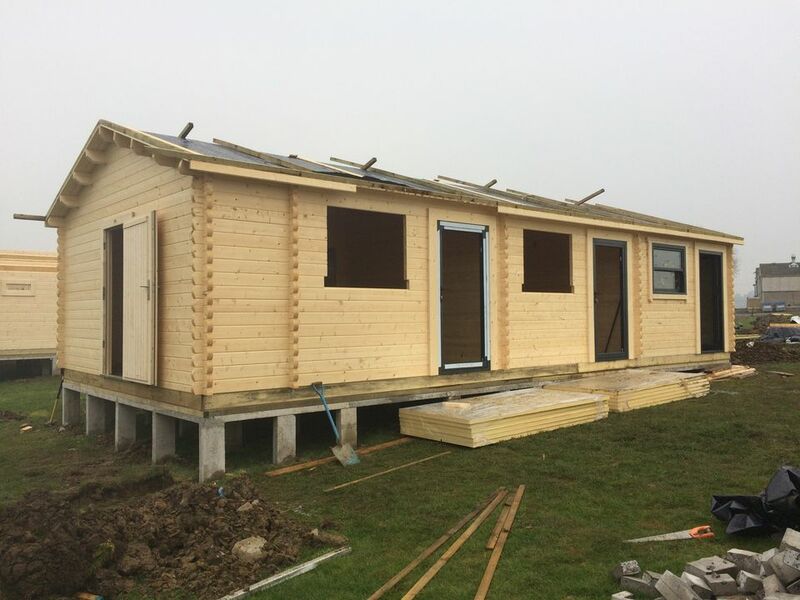 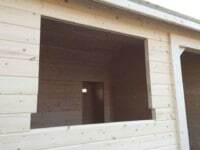 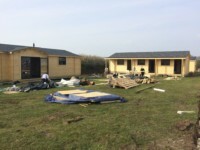 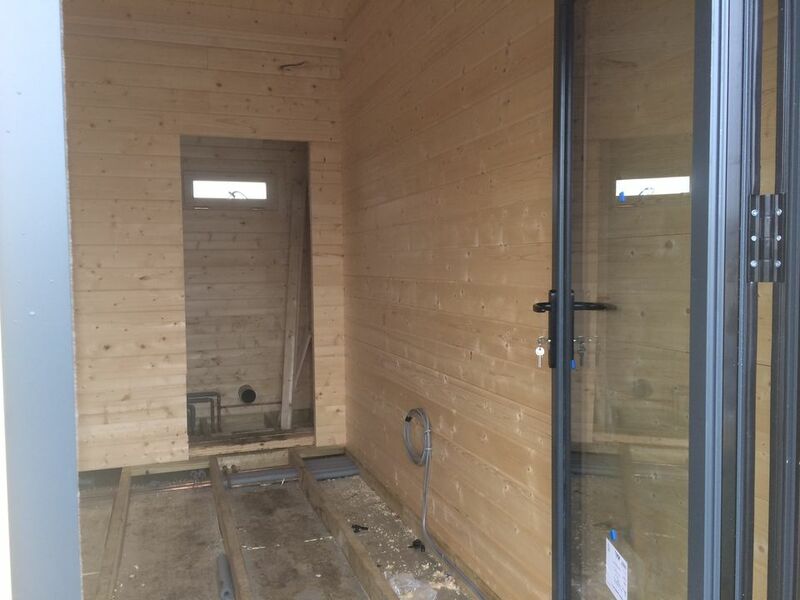 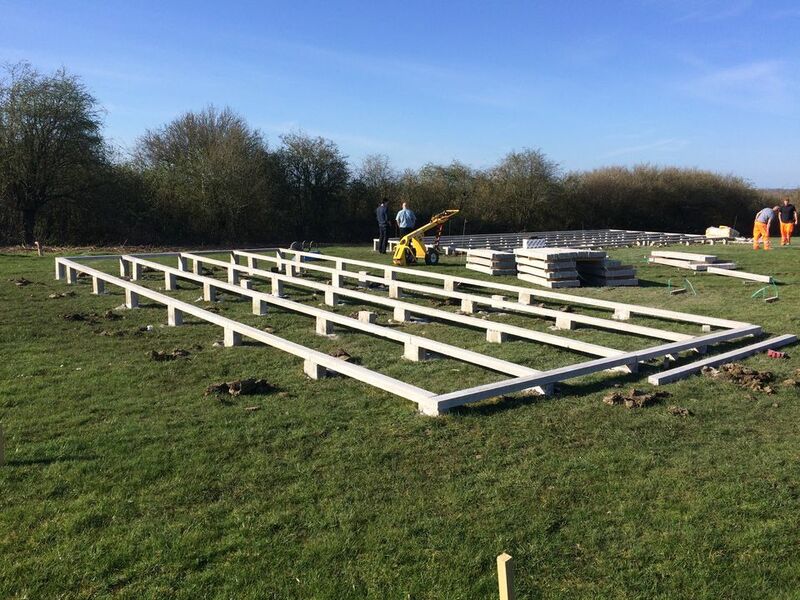 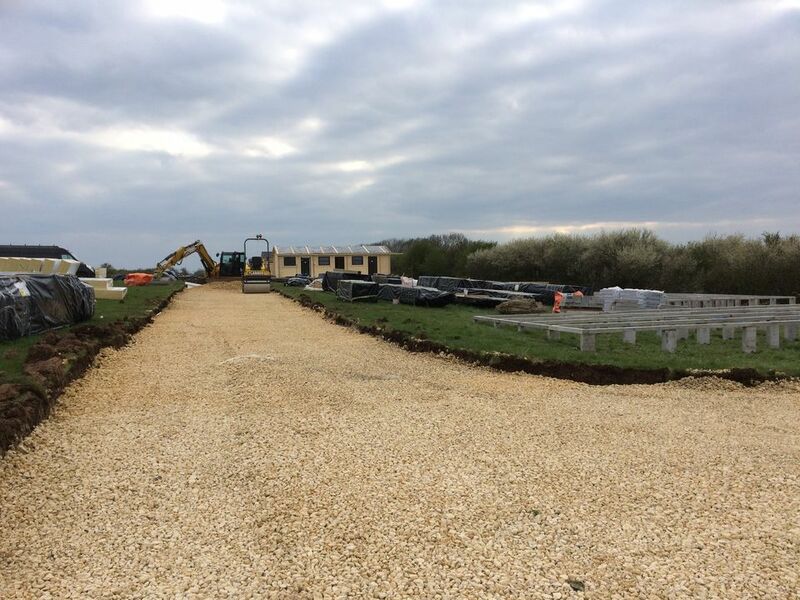 Windows and doors are now in cabin 4 and work has started on the final base 7. 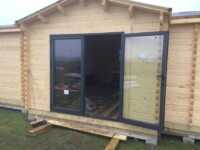 Over the weekend, aluminium doors and sash windows have been fitted. 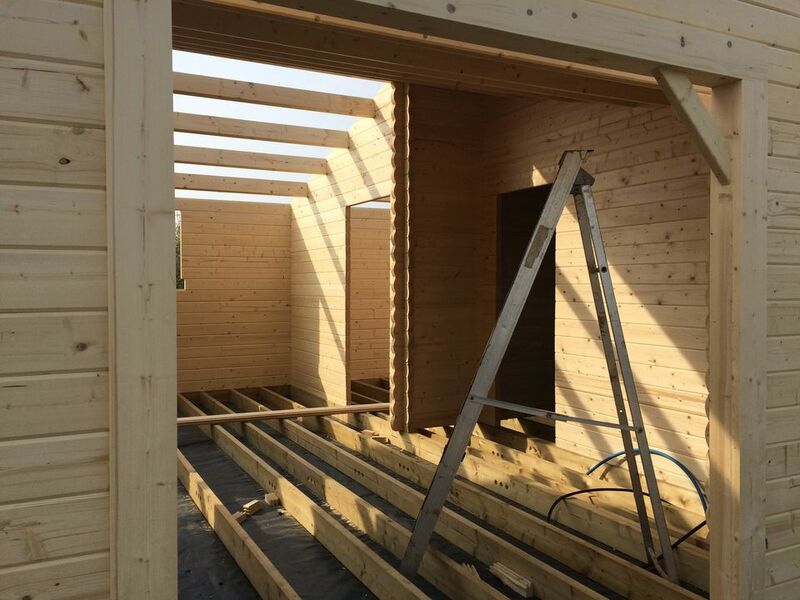 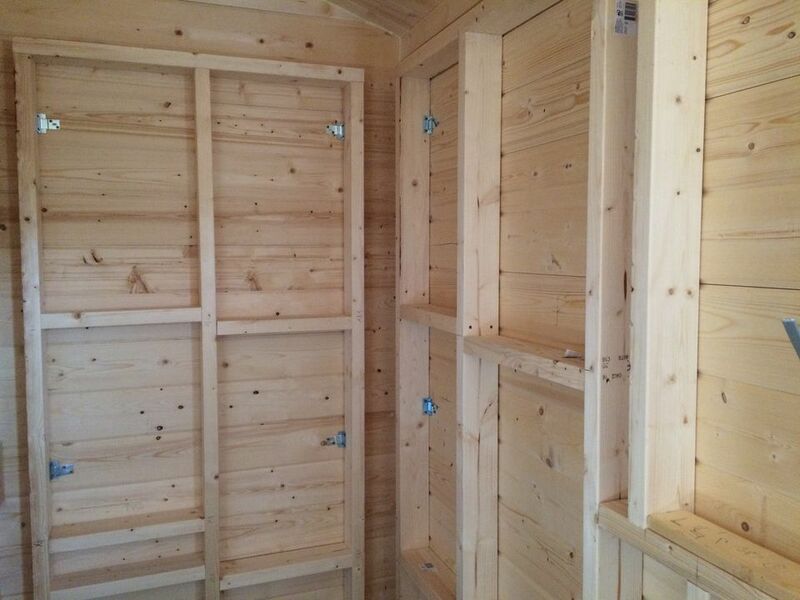 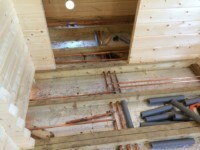 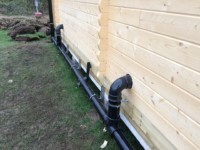 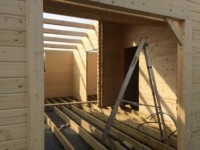 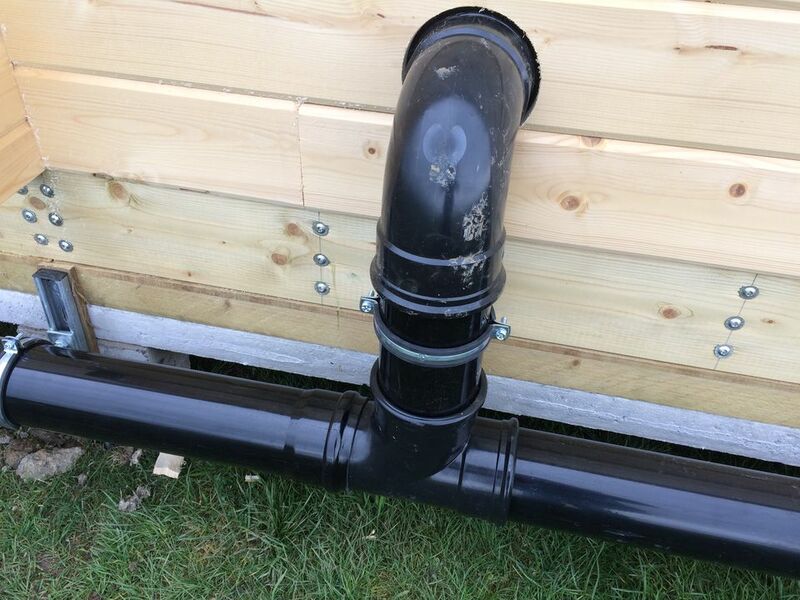 The plumbing work is coming along nicely in cabin 2 and cabin 4 has been built to roof height. 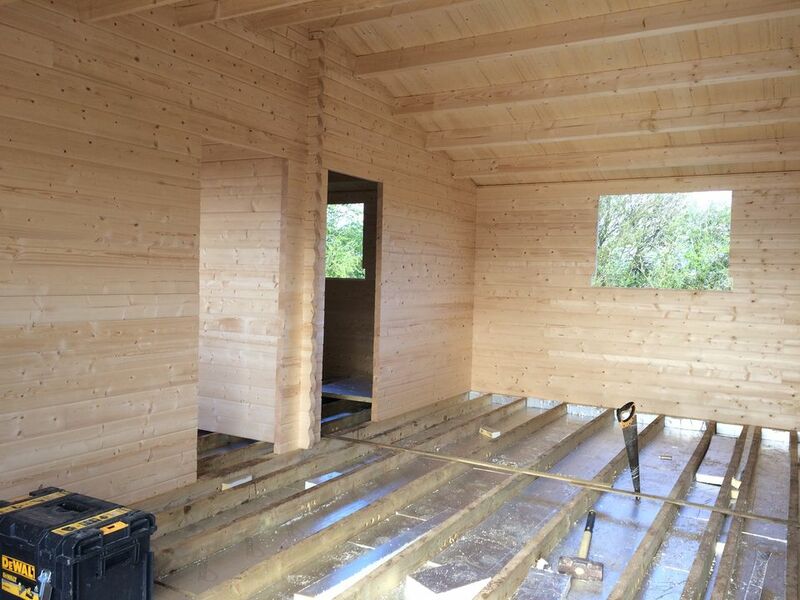 Work has begun building cabin 2. 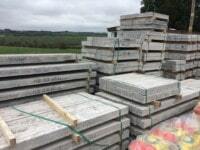 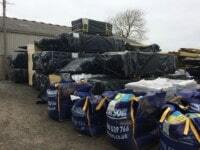 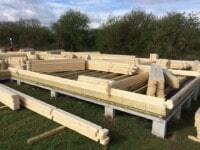 Logs are unpacked and laid out ready for building. 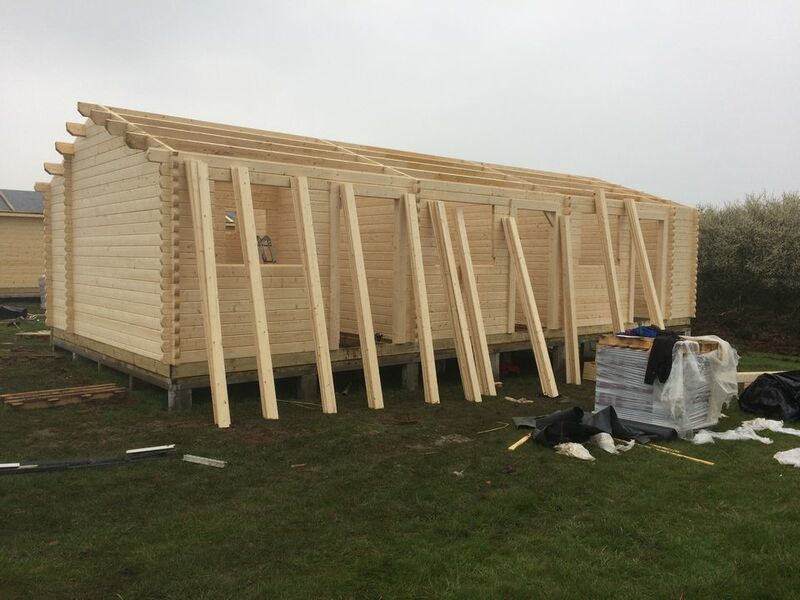 By the end of the day, we’re up to roof height with the purlins in place. 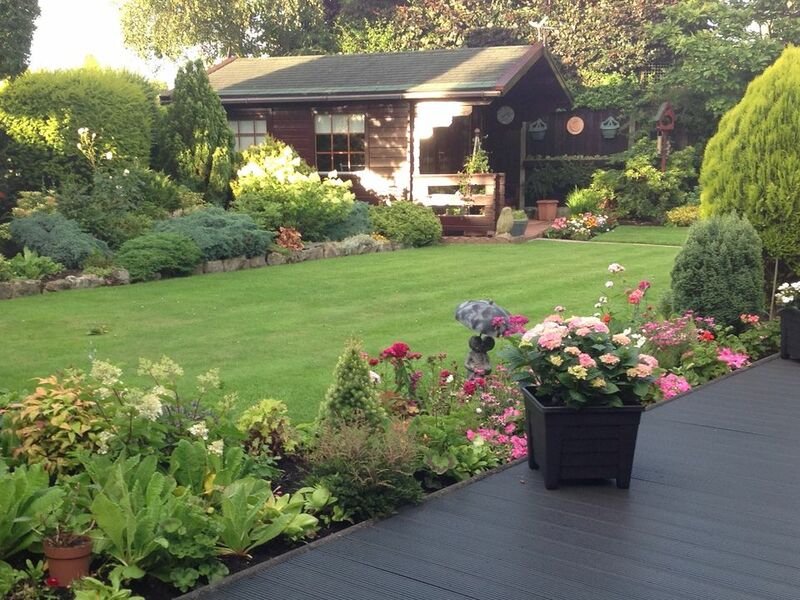 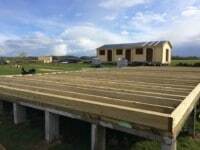 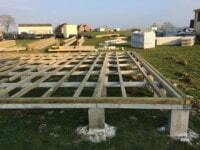 The timber base work is nearly complete on number 3. 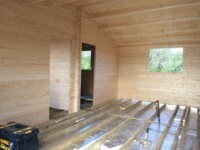 The timber chassis is complete on cabin 2. Base 3 is ready for the pressure treated timbers and base 4 is almost there. Work has begun on base 5. 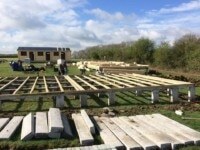 Fantastic progress today. 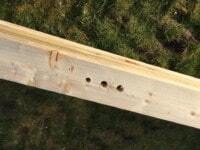 Holes have been pre drilled in the chassis timbers ready for plumbing pipework. 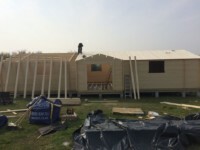 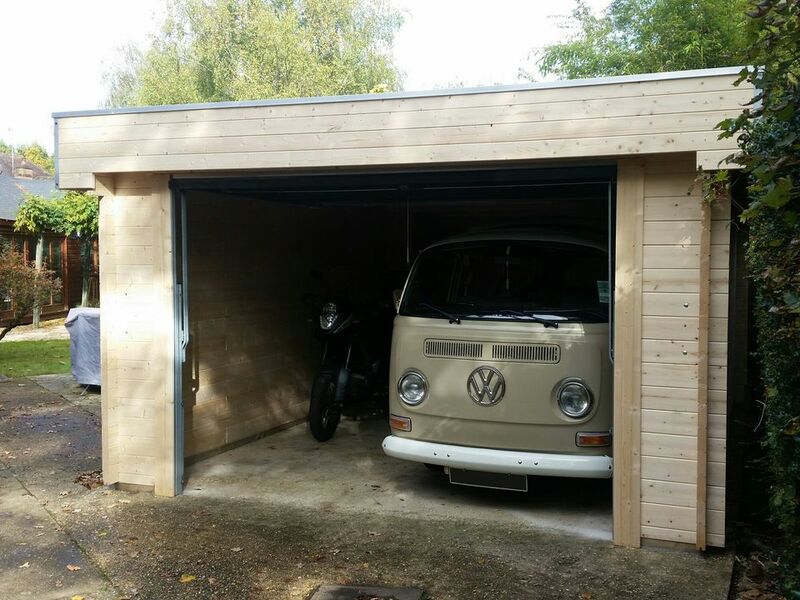 The walls are up, door frames in, roof purlins and roof boards on and floor insulation fitted. 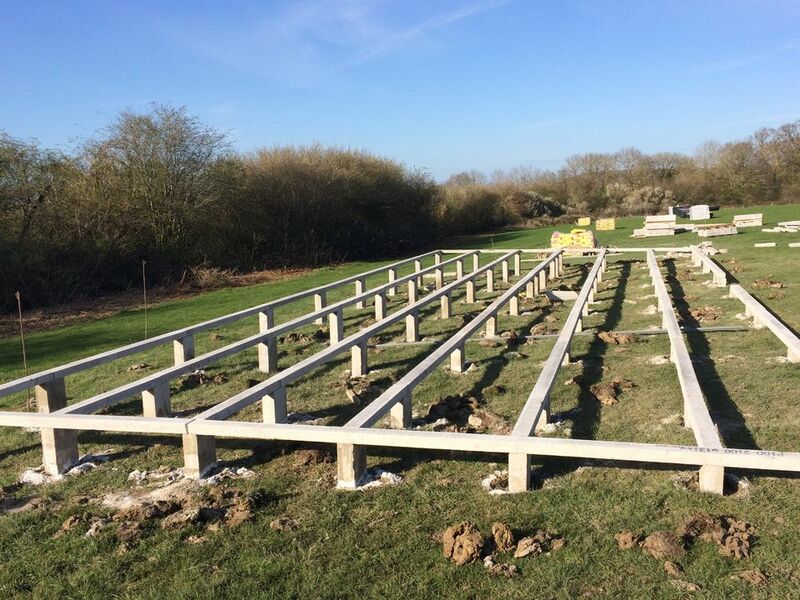 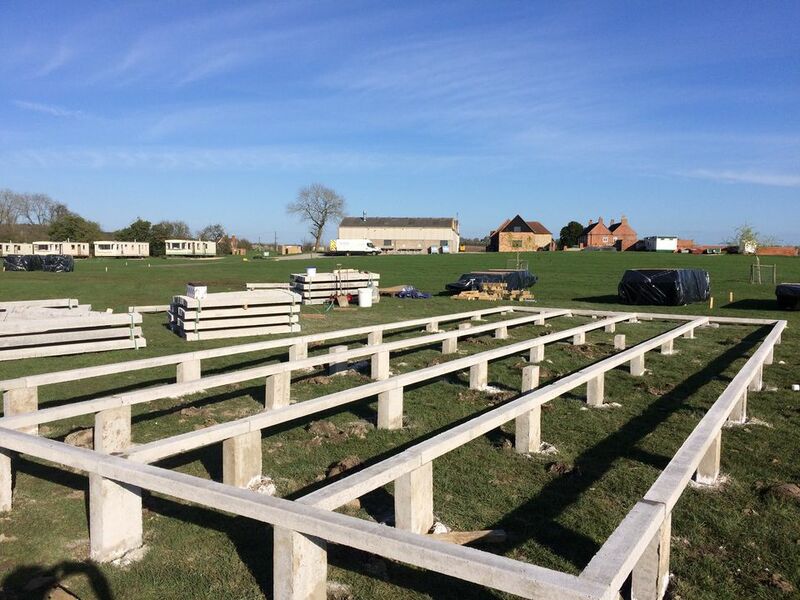 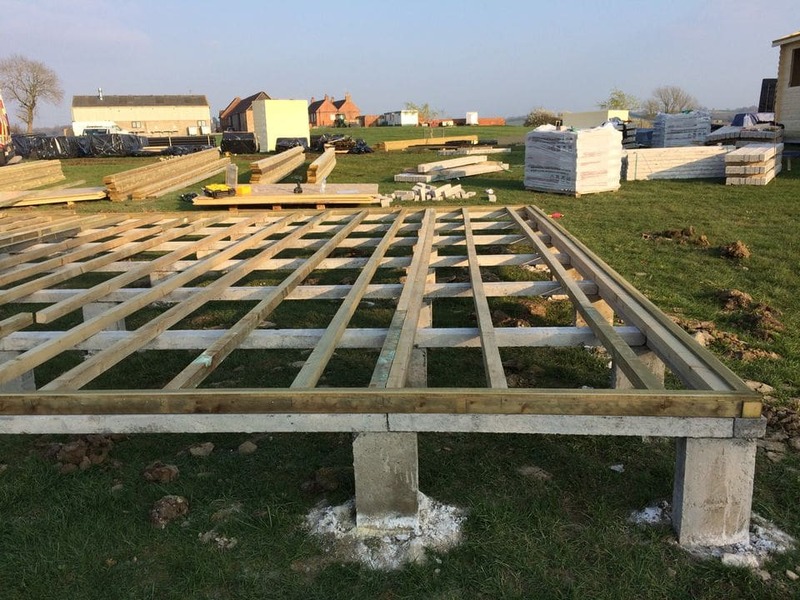 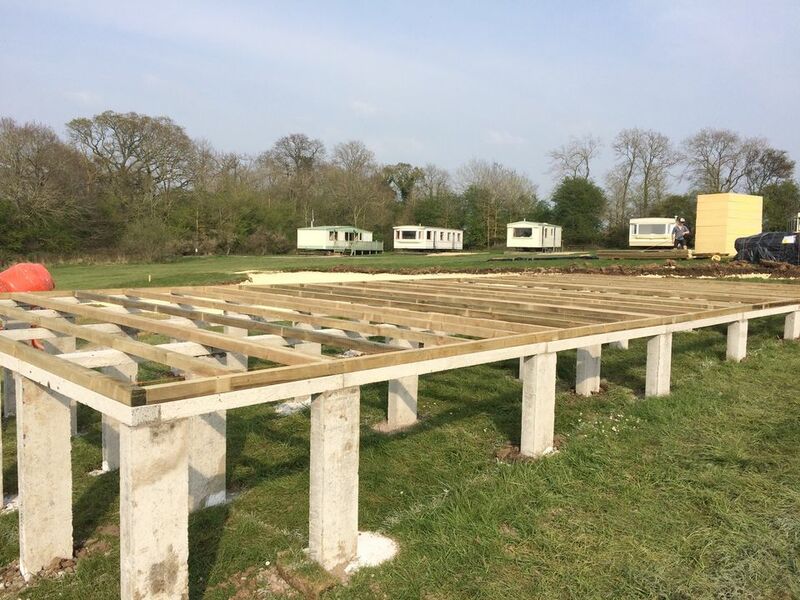 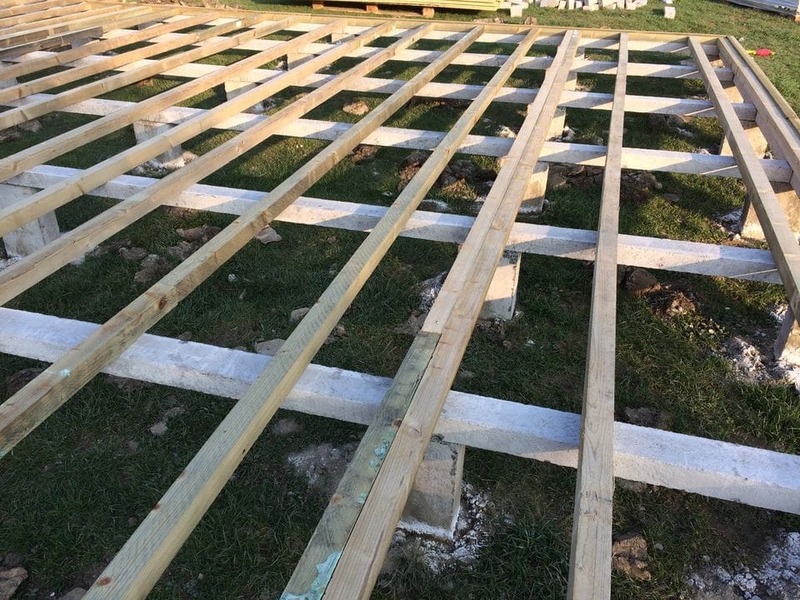 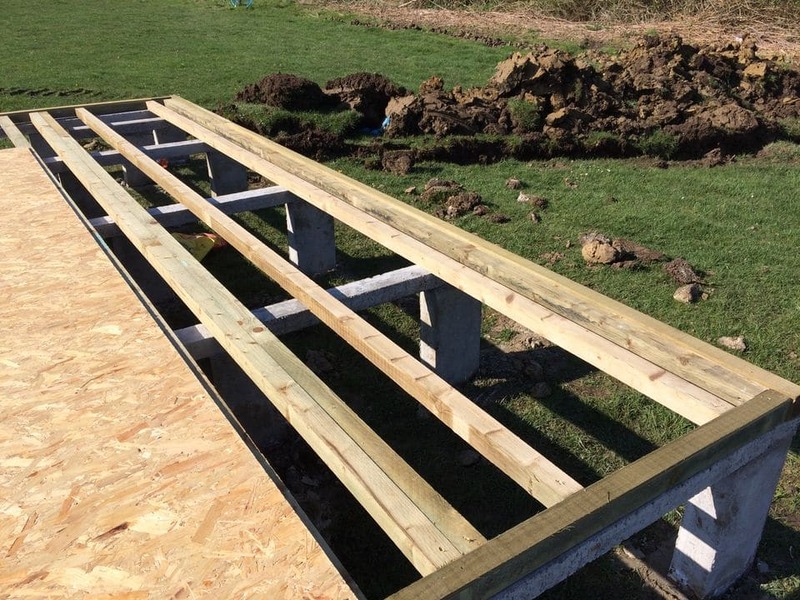 The timber work has started on the second base. 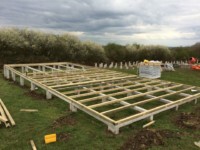 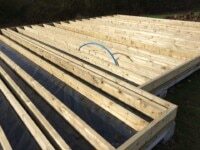 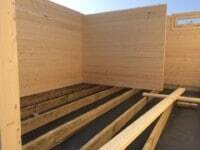 A network of pressure treated timbers sit on top of the concrete base and is boarded over with OSB. 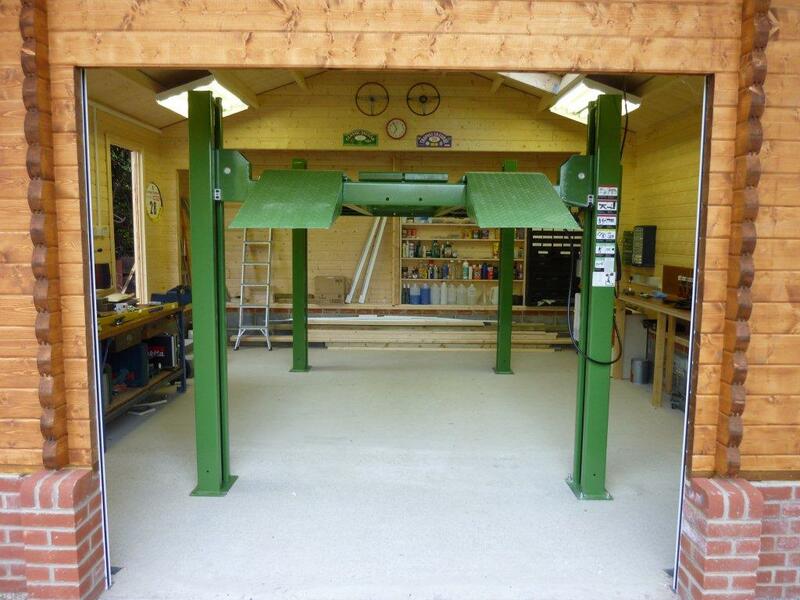 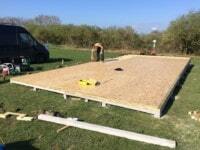 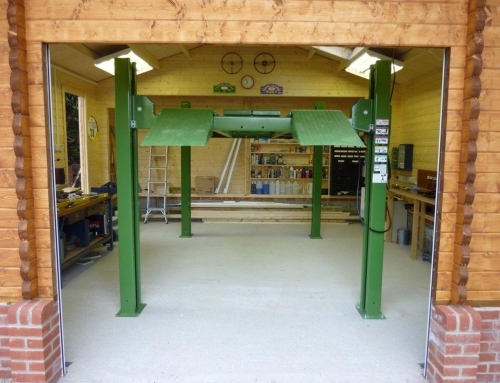 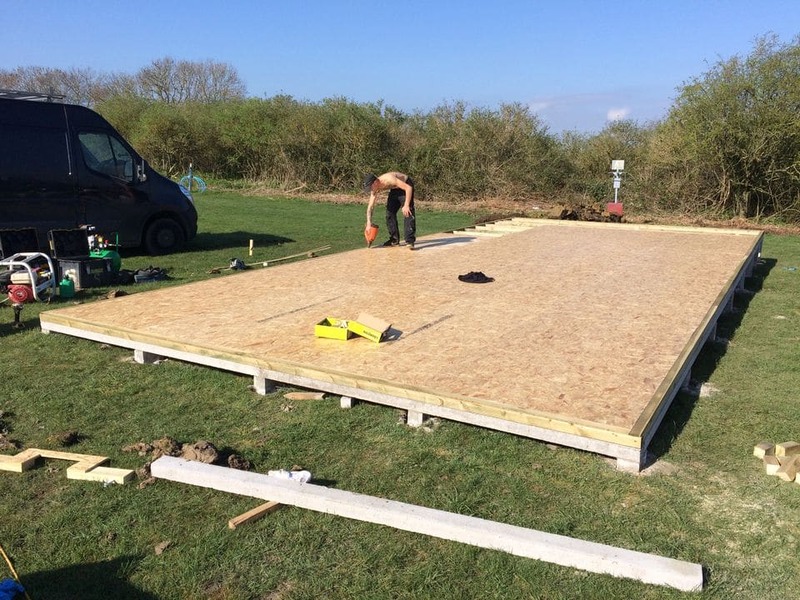 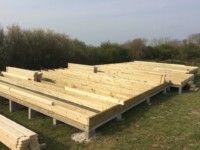 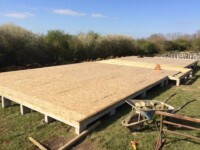 This provides a platform ready for the log cabin timber chassis to go on top. 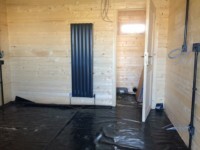 A damp proof membrane is laid over the OSB surface. 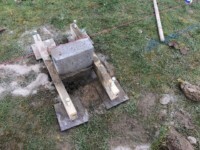 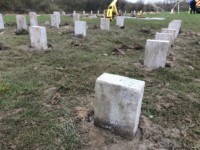 Trenches have been dug under the bases in preparation to run services below. 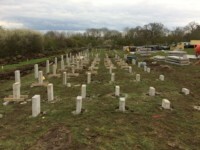 Reinforced concrete lintels span the pillars. 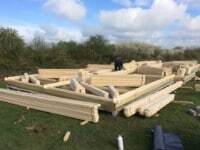 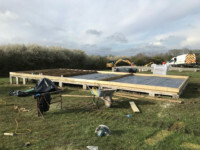 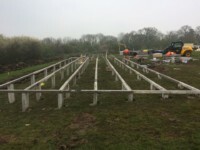 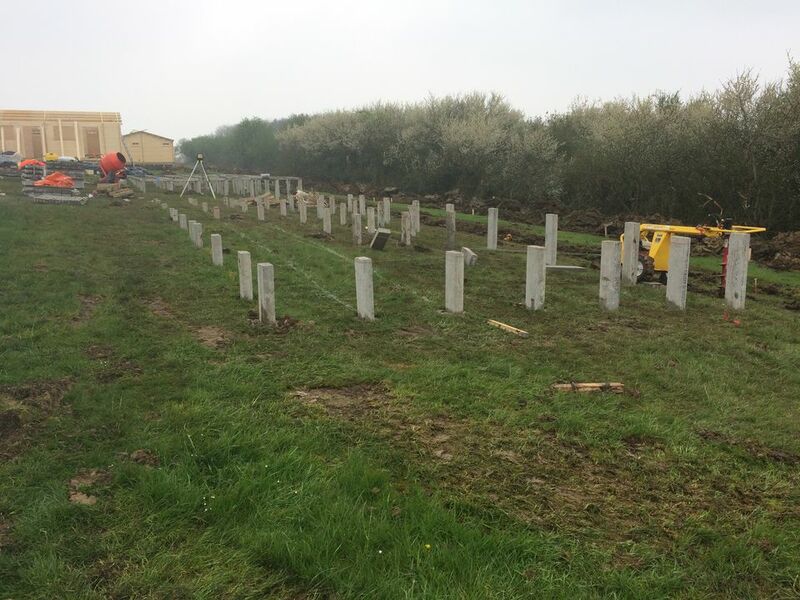 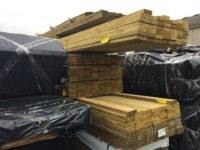 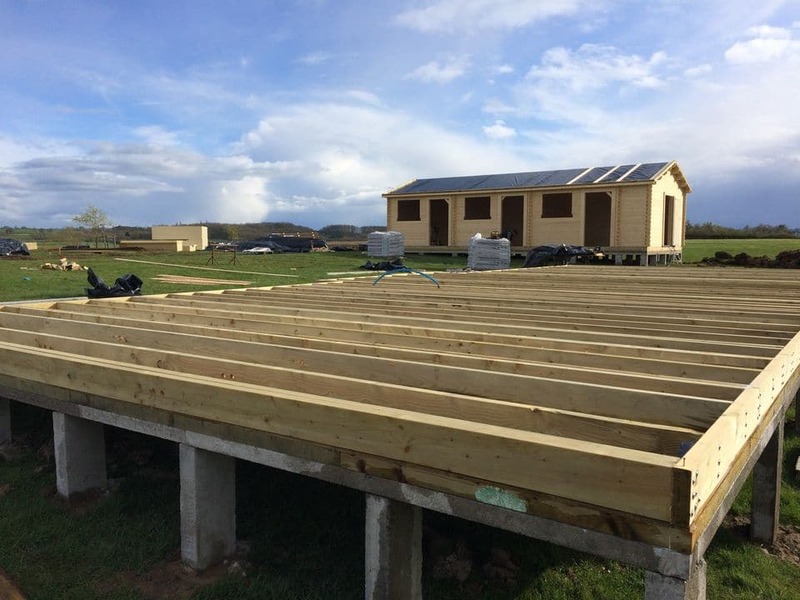 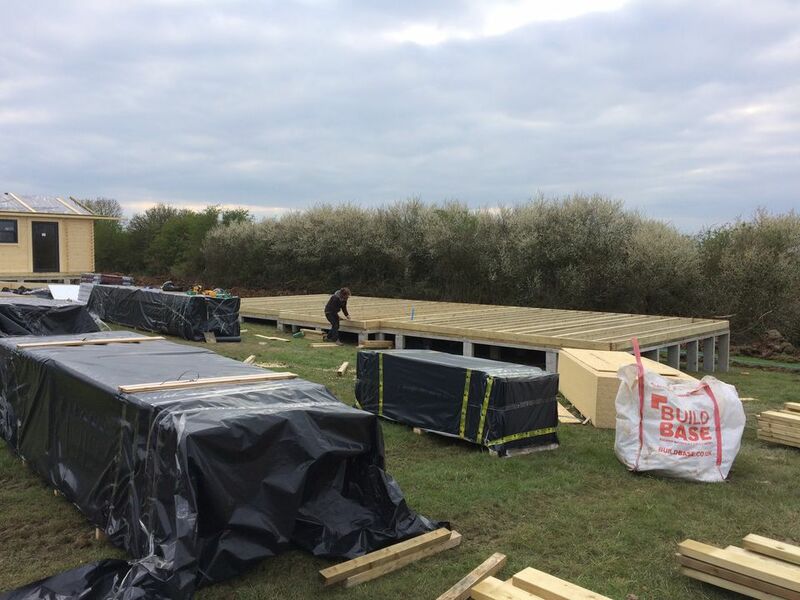 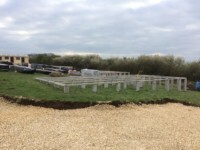 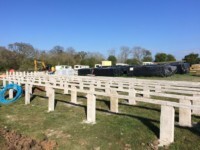 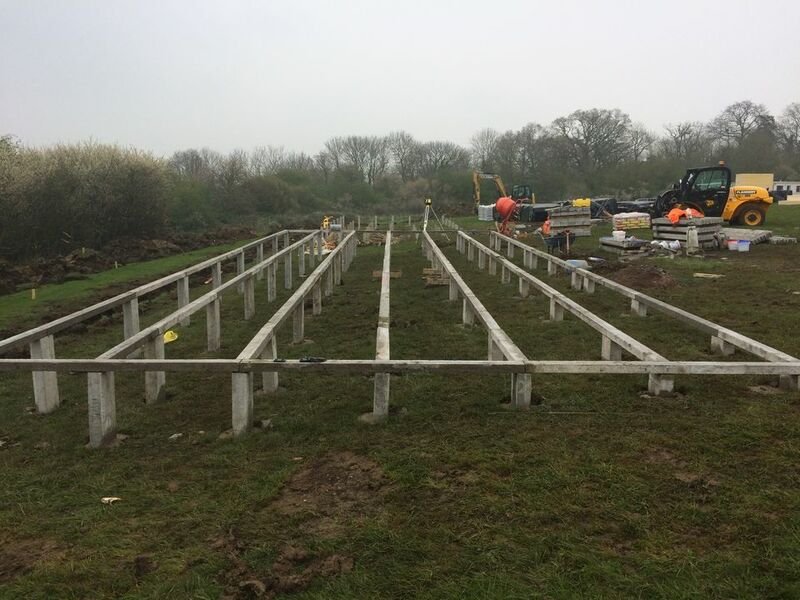 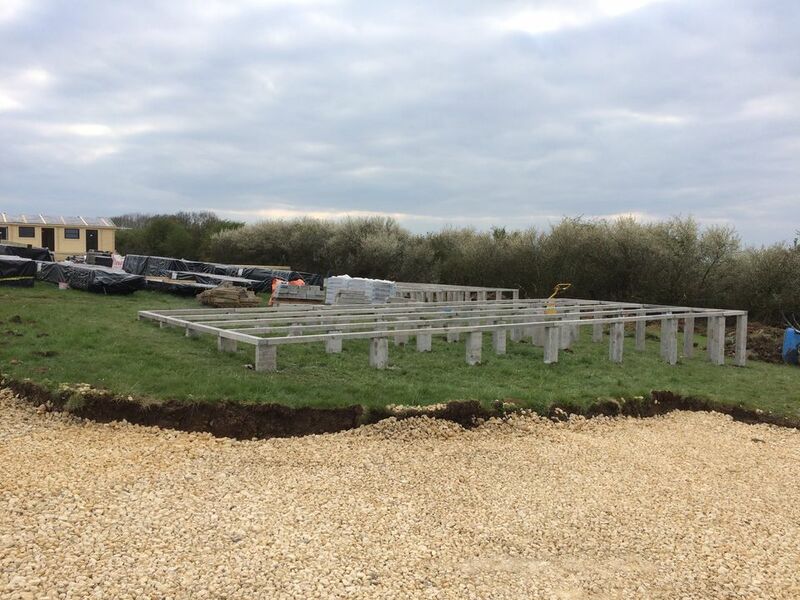 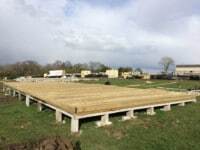 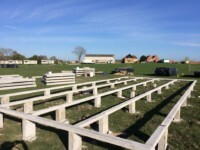 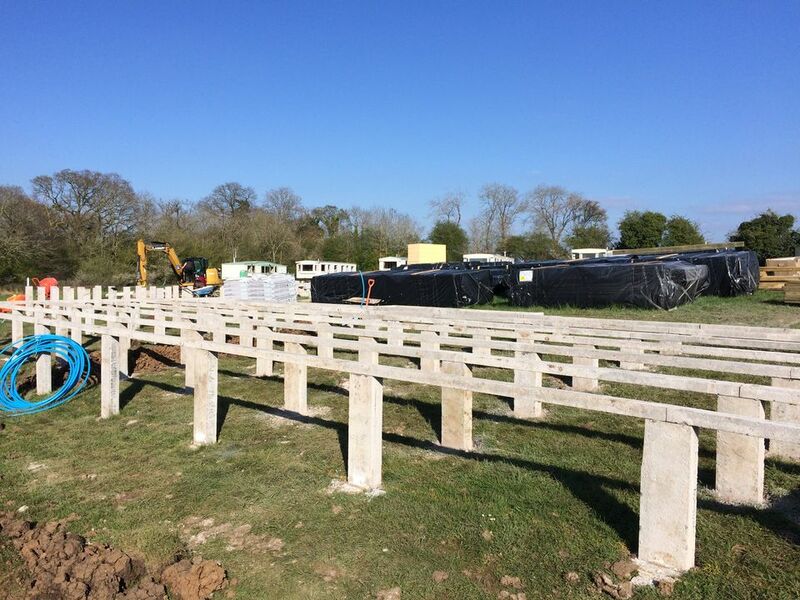 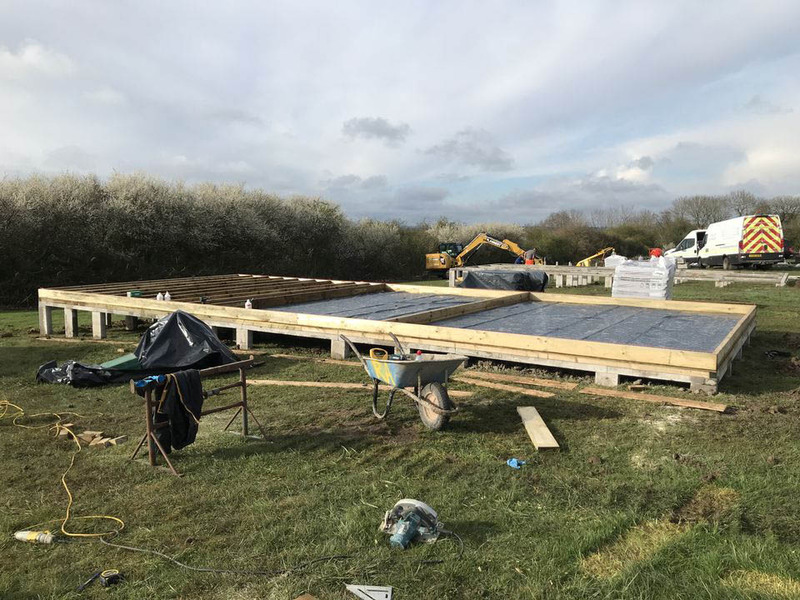 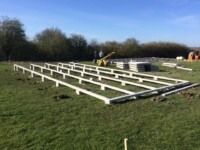 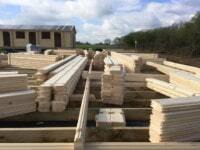 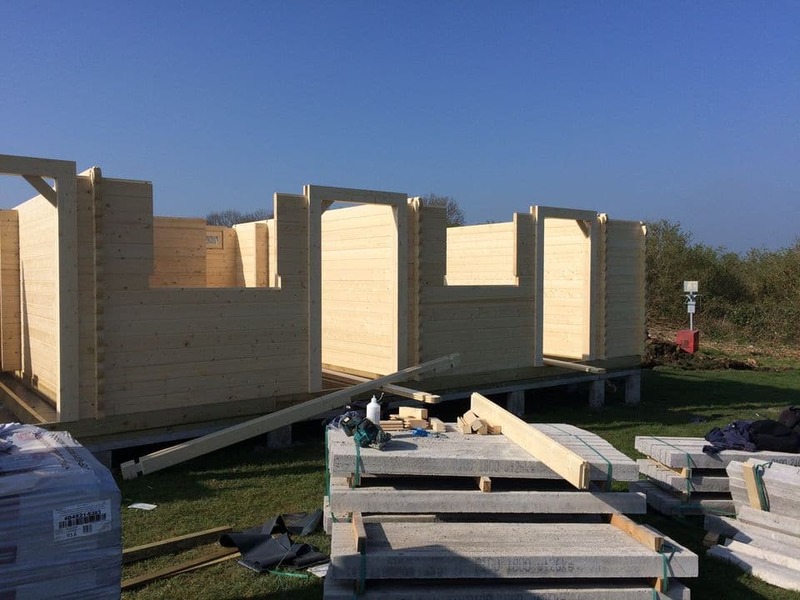 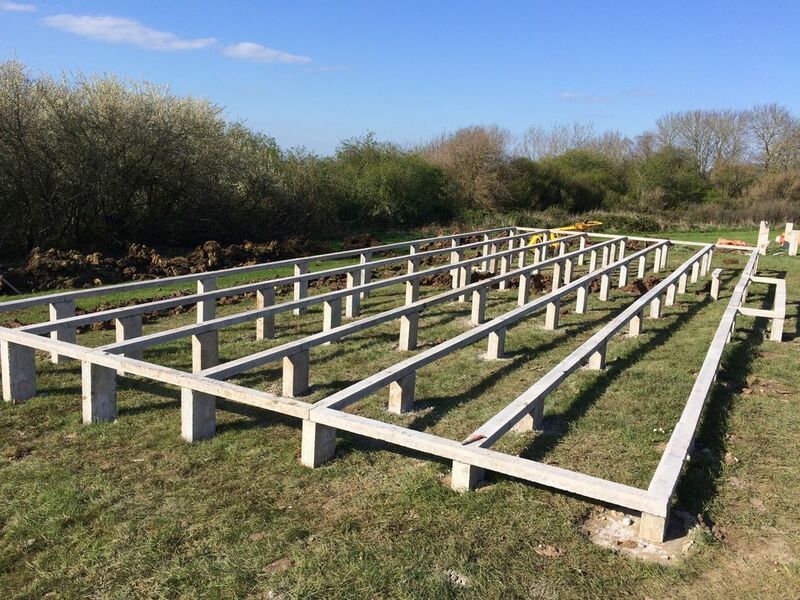 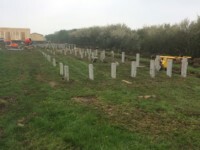 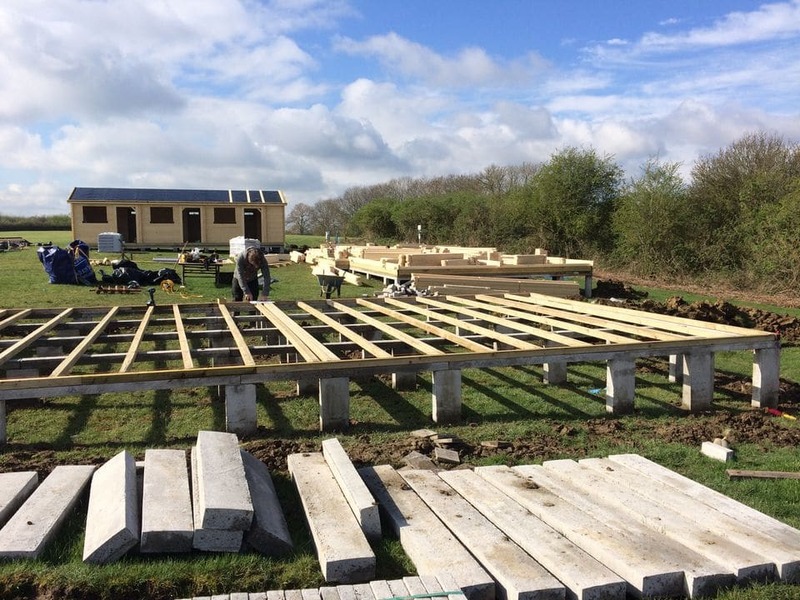 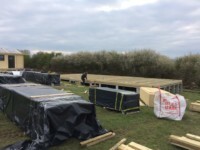 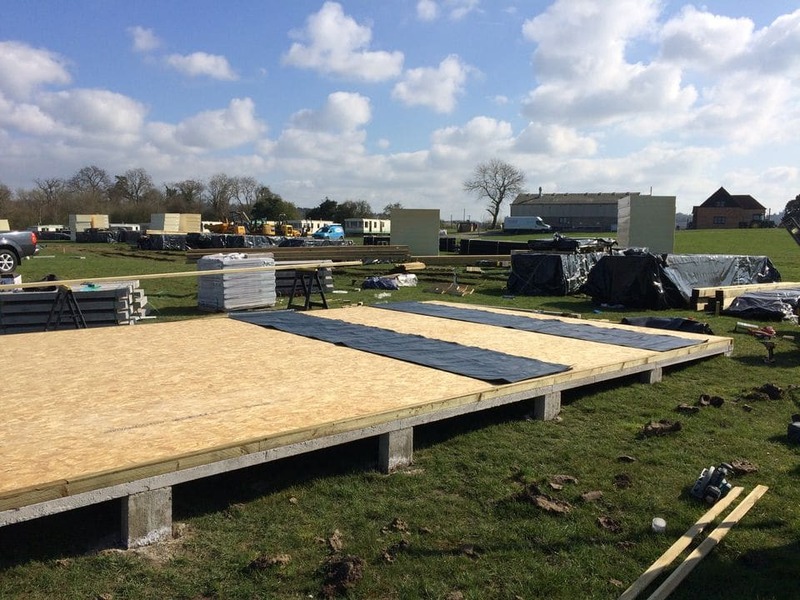 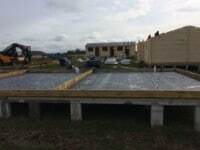 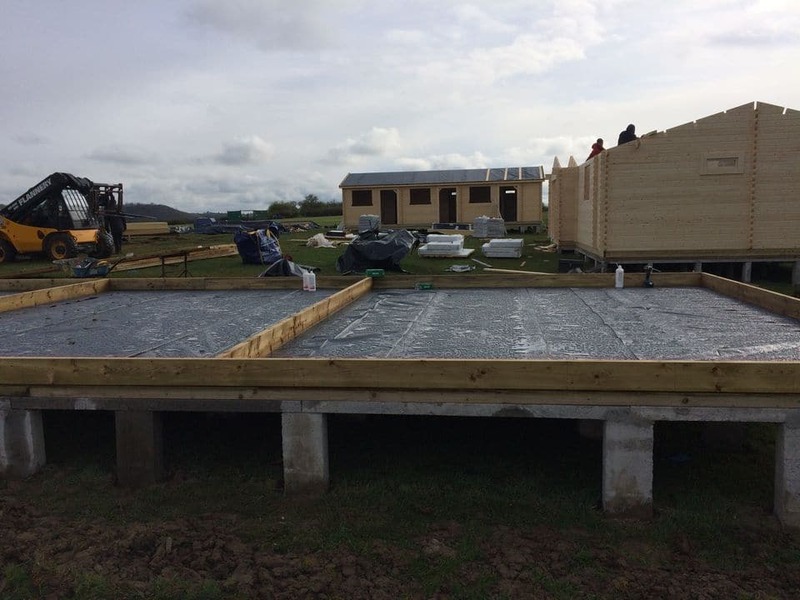 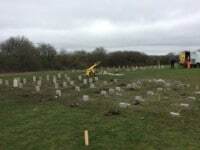 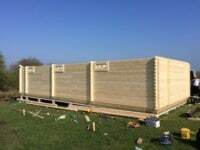 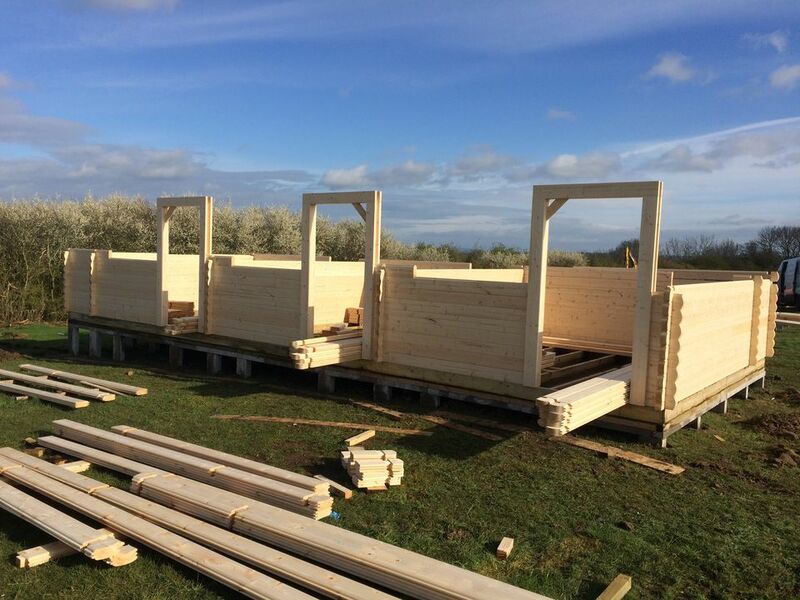 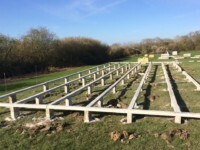 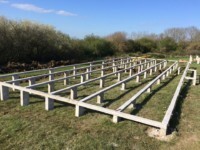 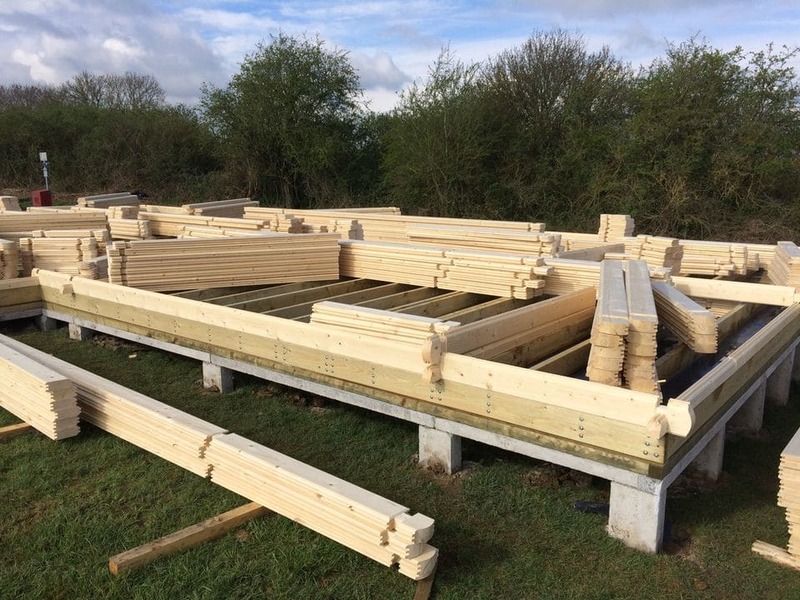 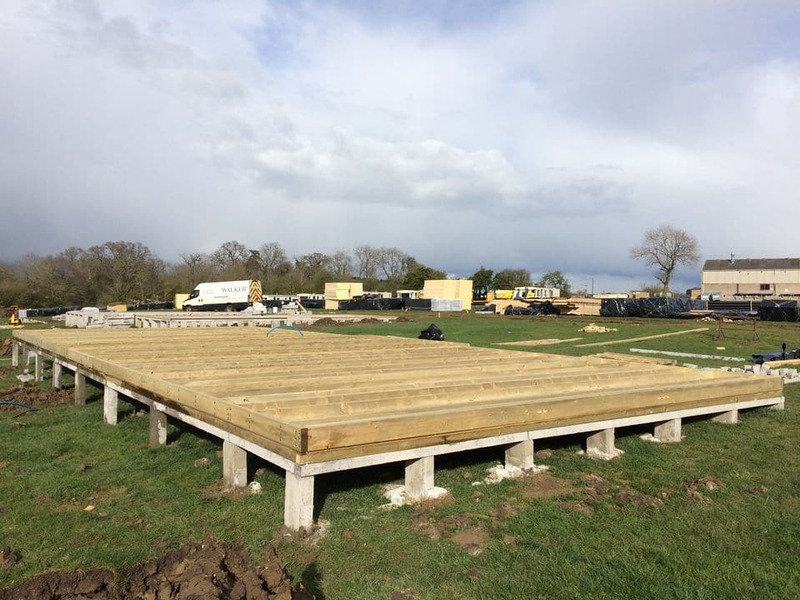 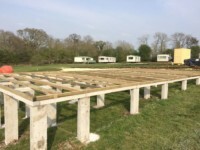 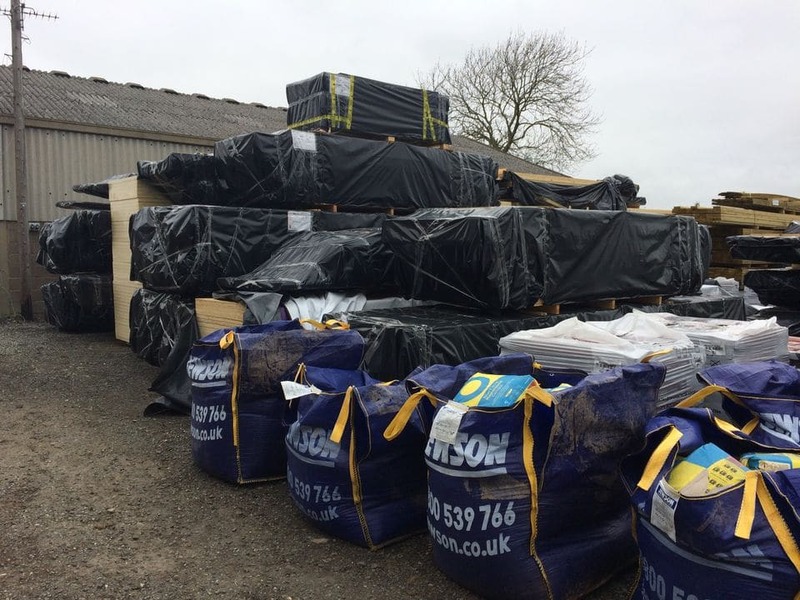 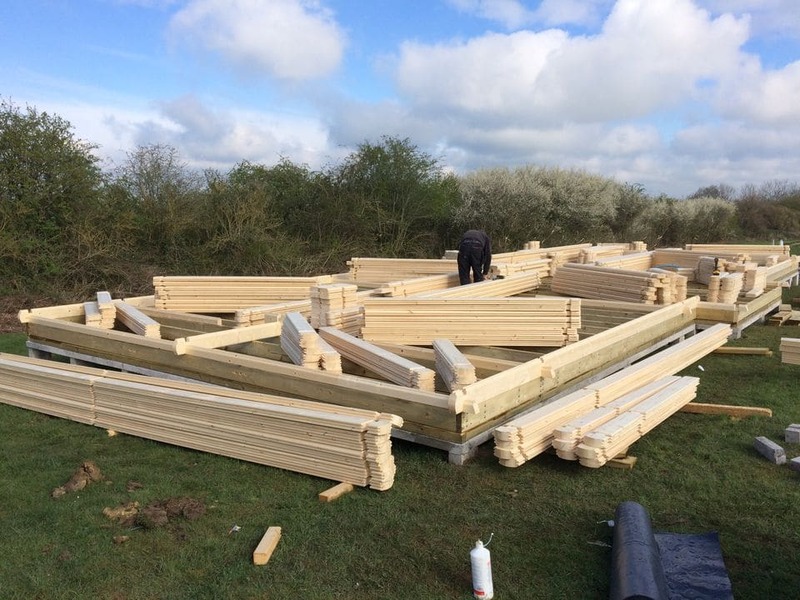 The pallets containing materials for all seven log cabins have been delivered are now on site along with other materials for the bases. 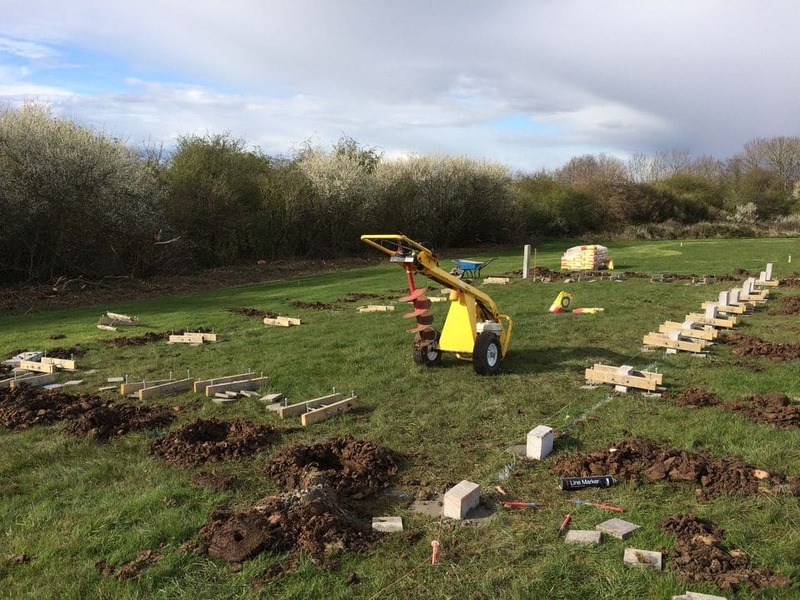 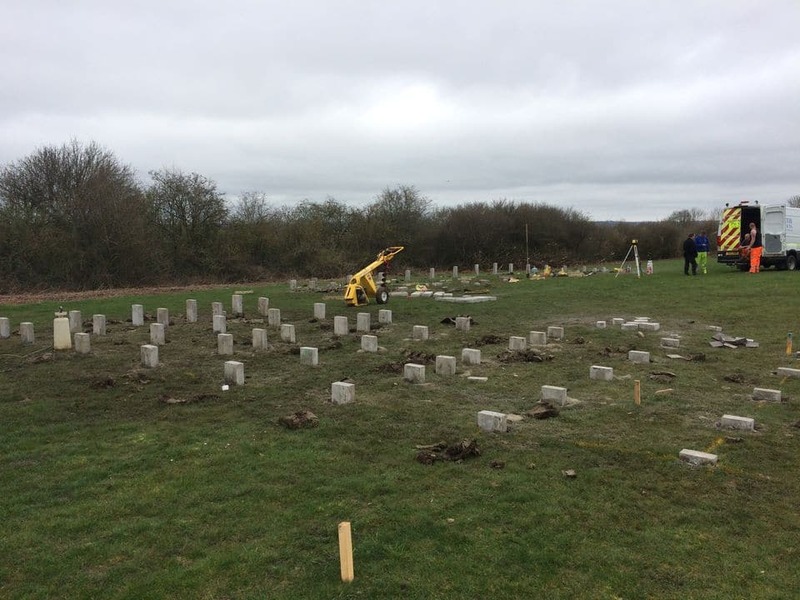 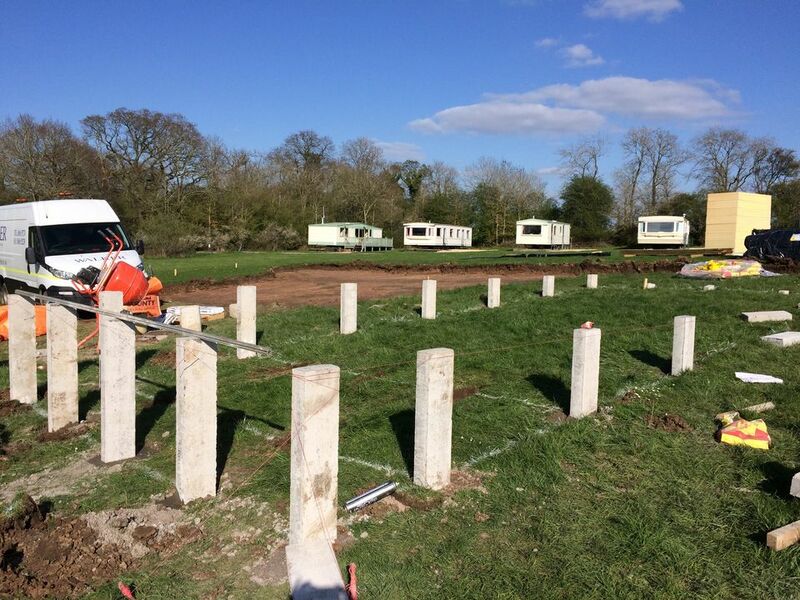 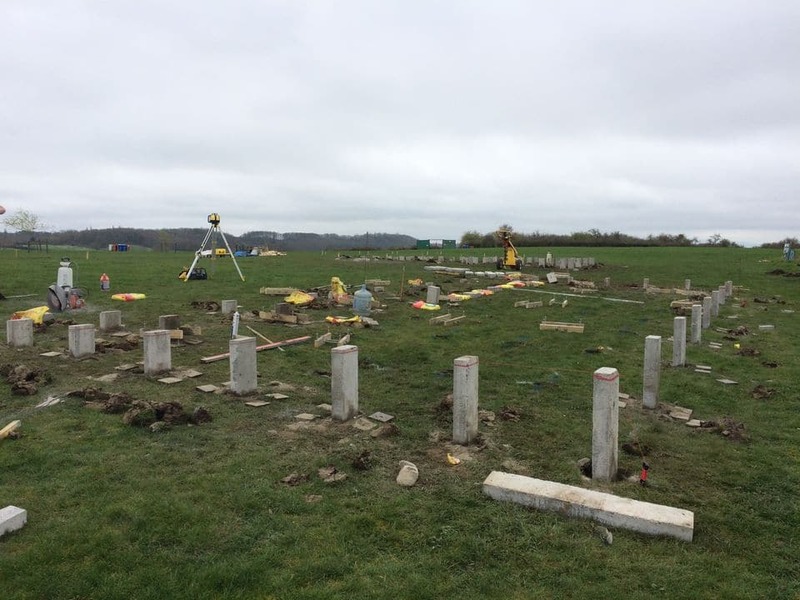 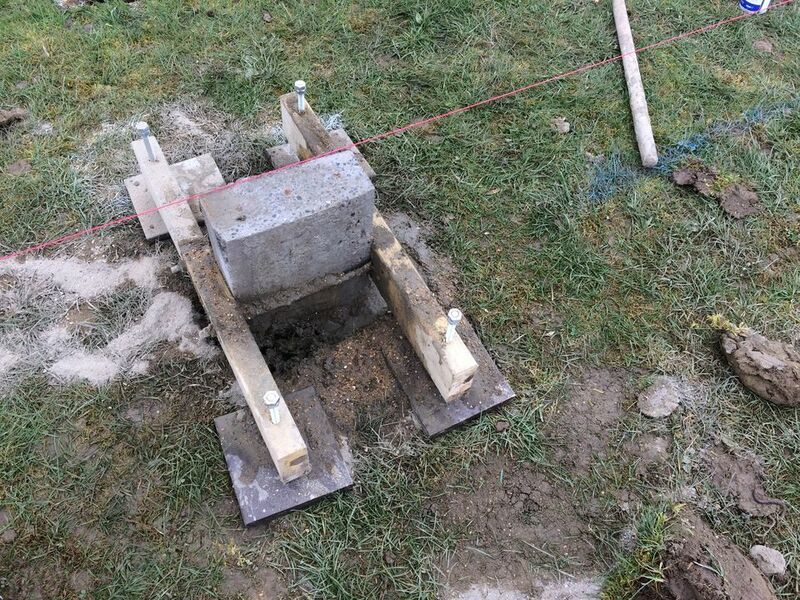 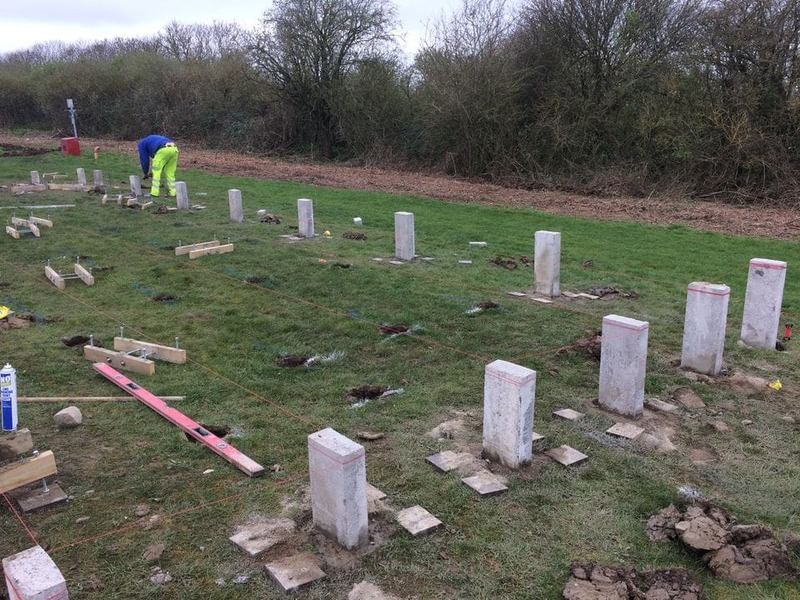 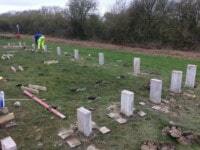 Ground levels and markers have been set out and work has started on the first two bases. 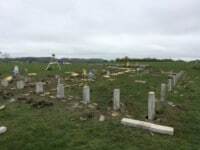 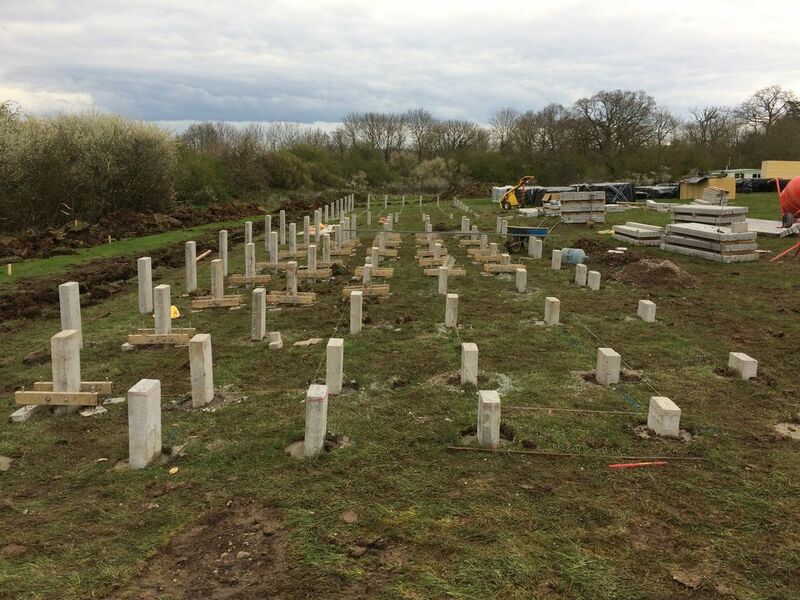 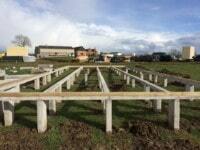 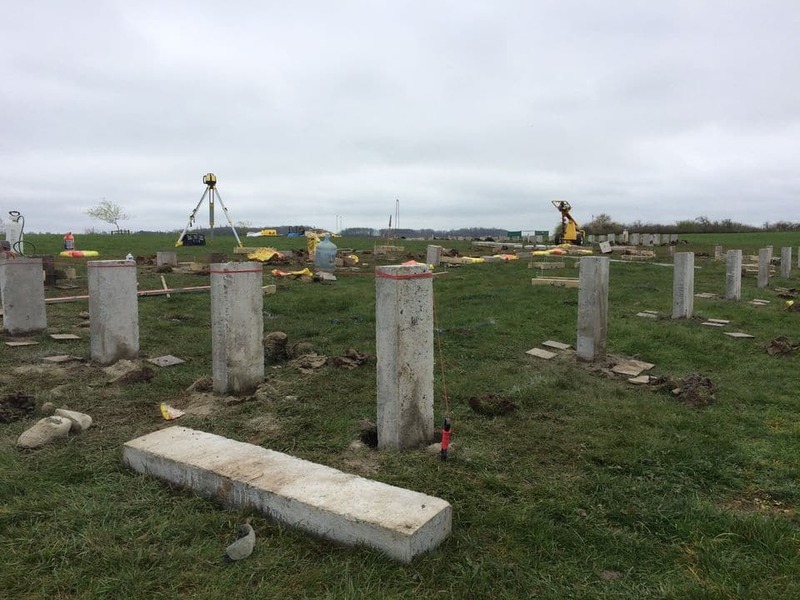 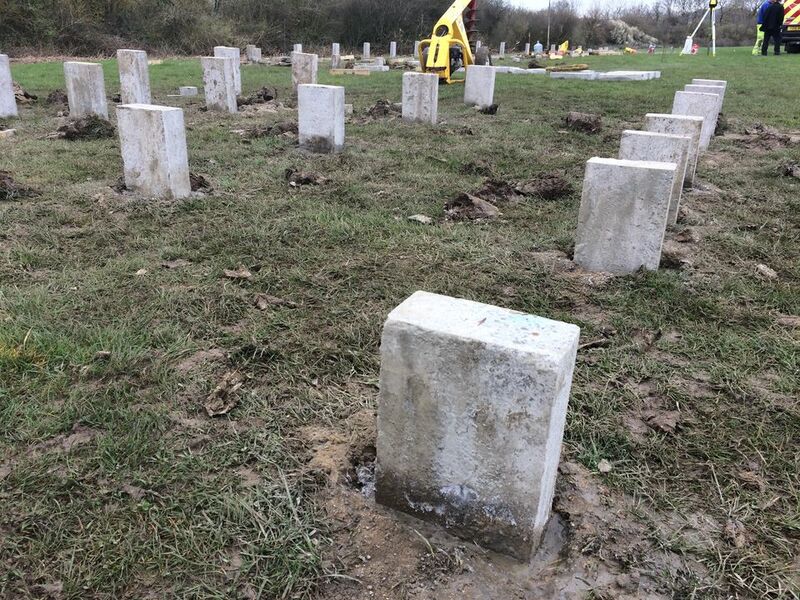 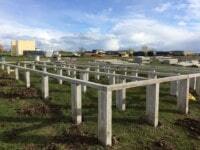 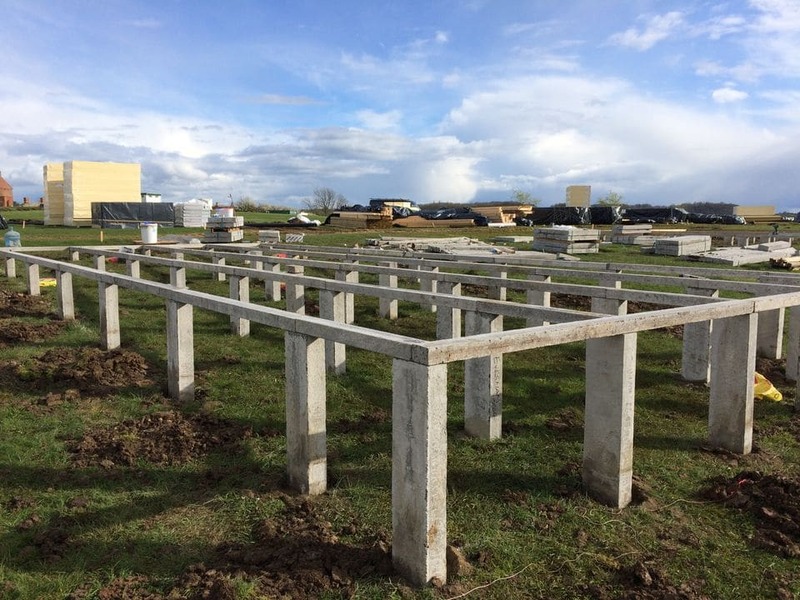 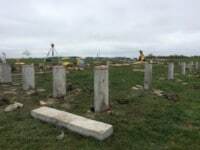 Concrete pillars are set into the ground. 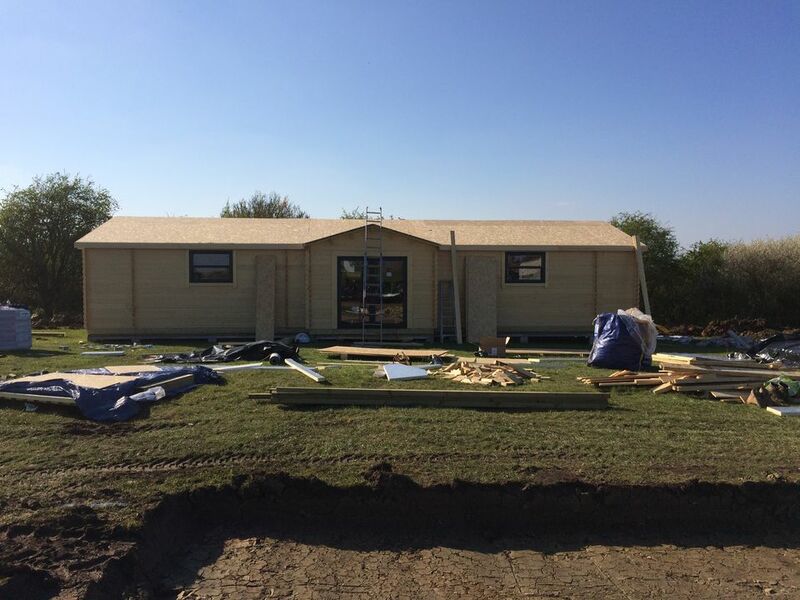 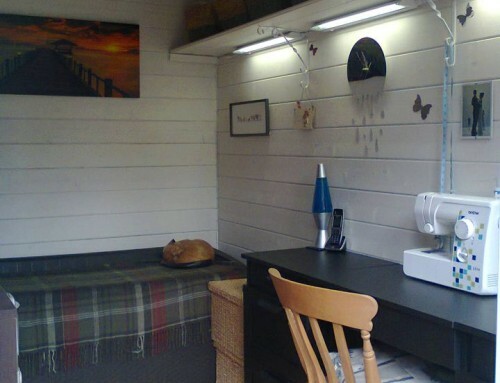 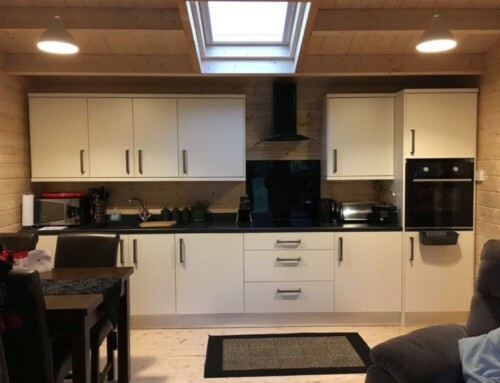 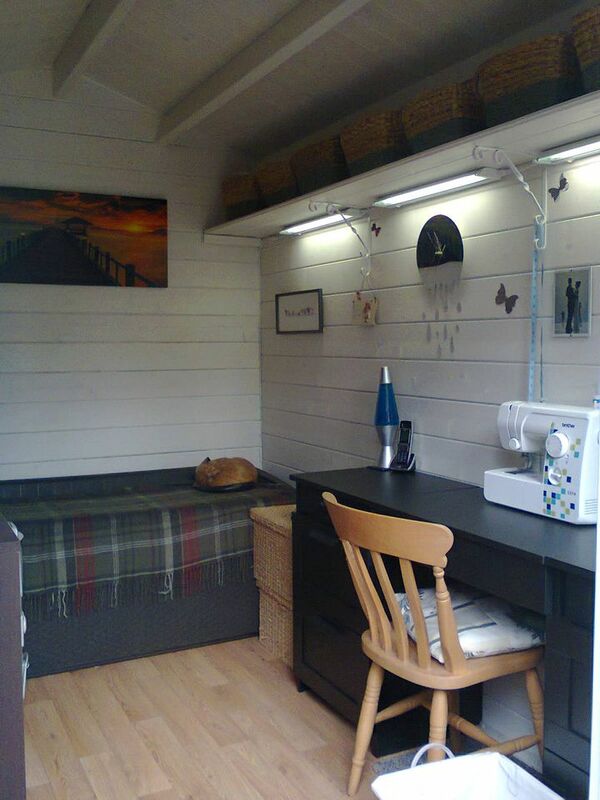 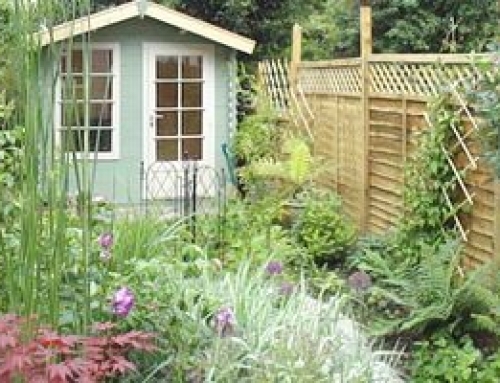 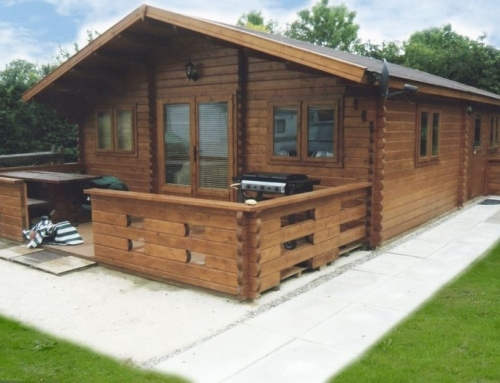 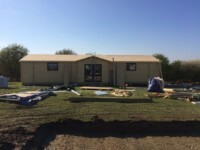 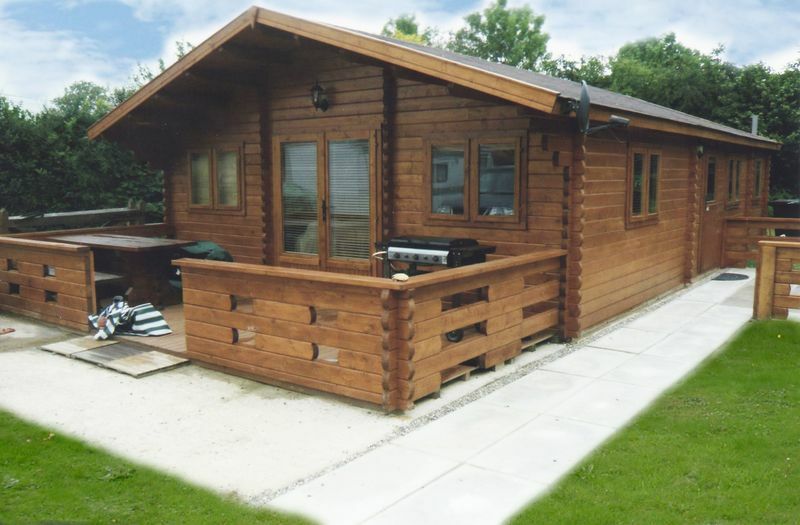 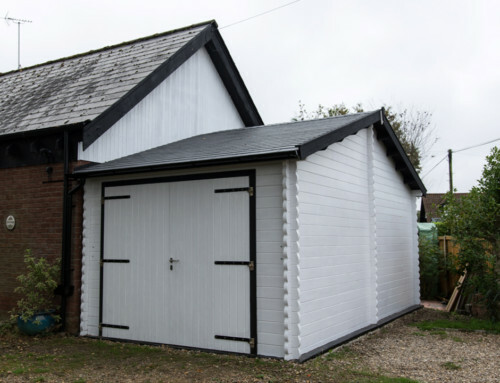 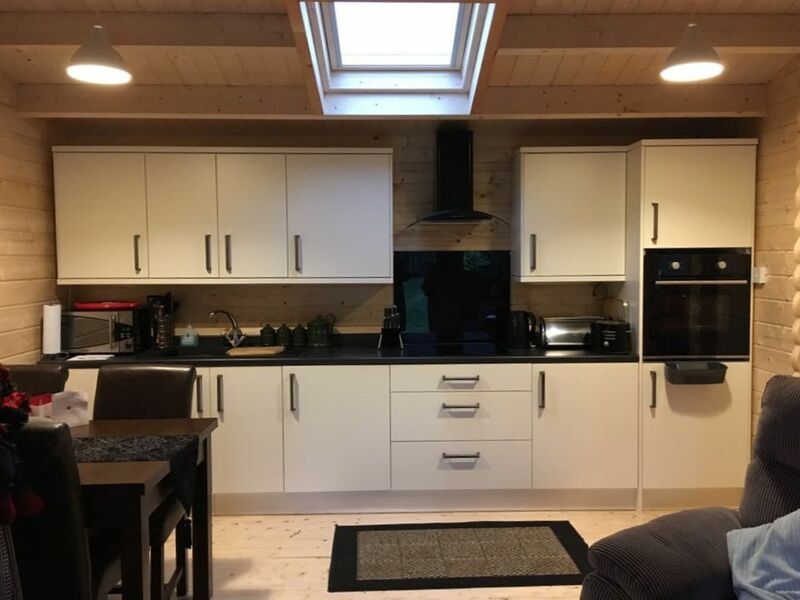 There are two cabin designs – the three bedroom, three bathroom mobile home measures 4.85m x 11m and has an eaves canopy to the front with posts. 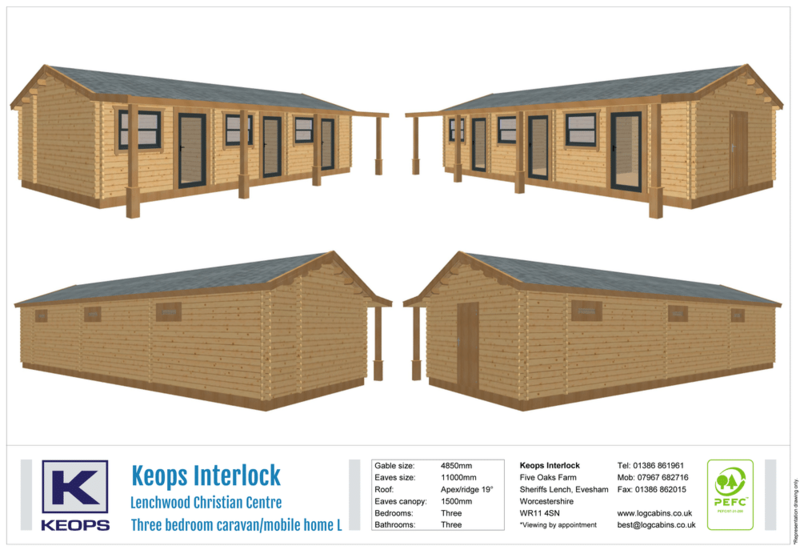 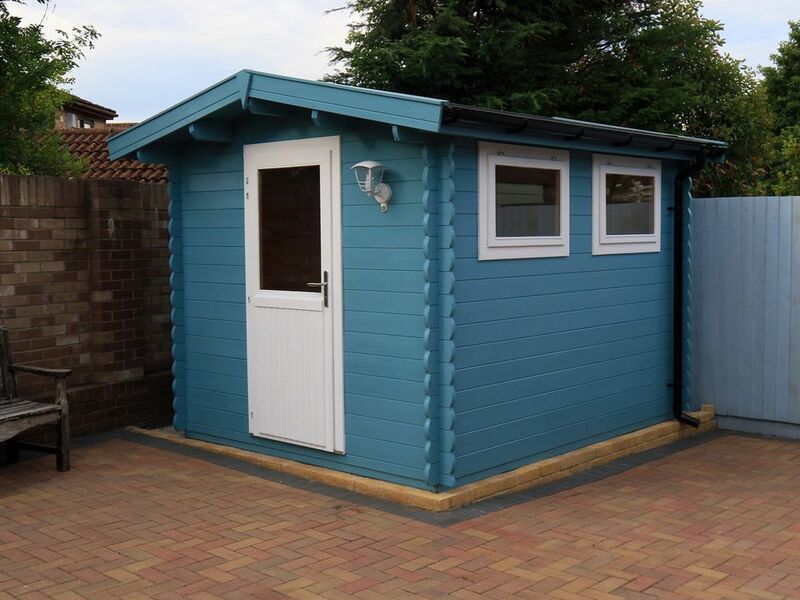 The four bedroom, four bathroom mobile home measures 15m x 6m and has a feature entrance porch and a central communal space with kitchen. 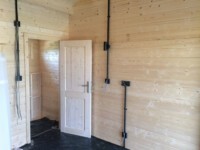 One of the bedrooms in each of these units has wider doors and adapted bathroom for disabled access. 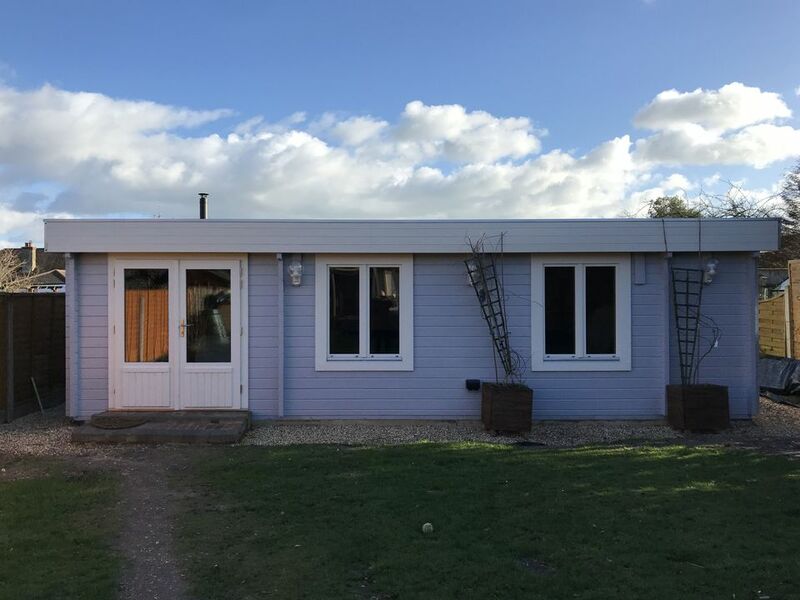 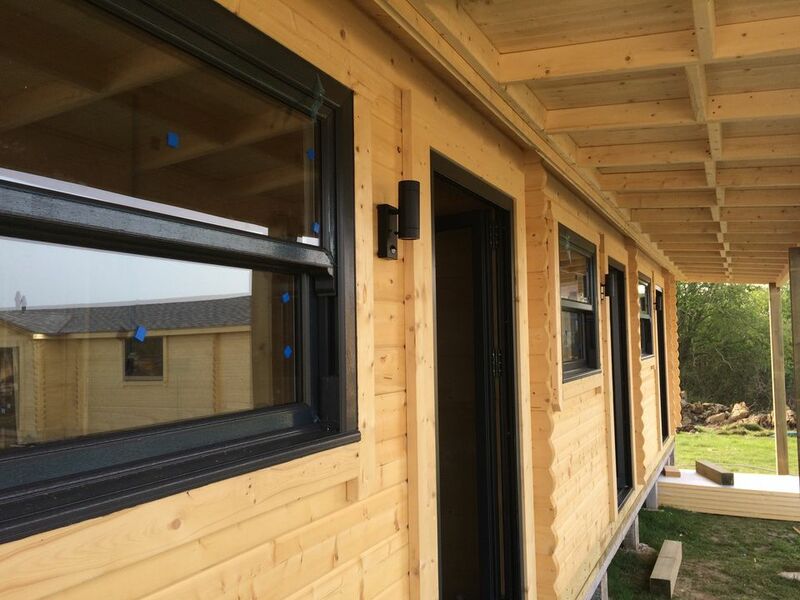 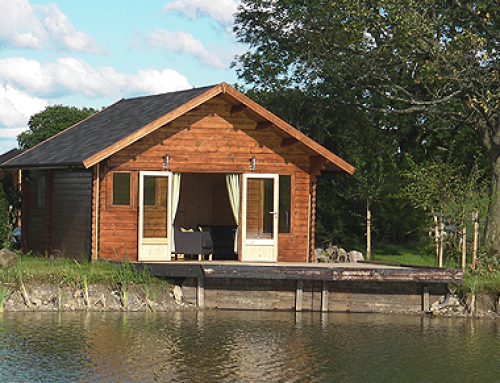 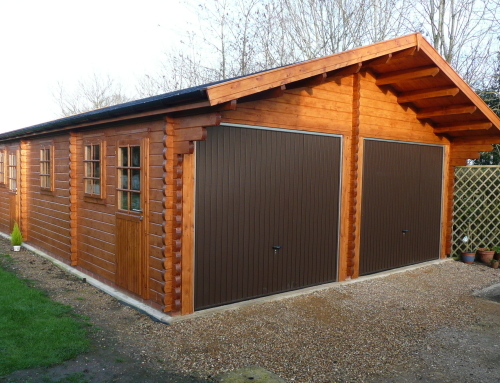 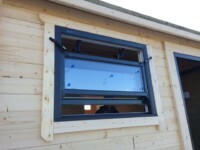 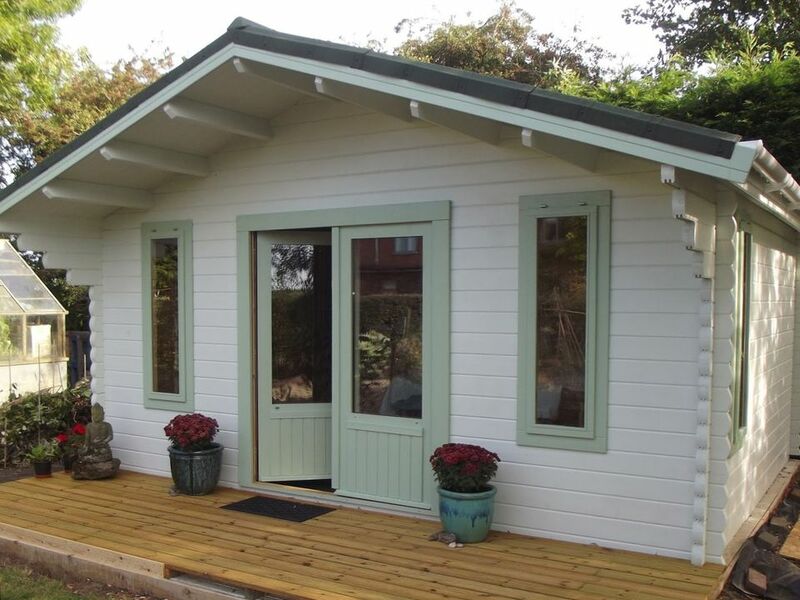 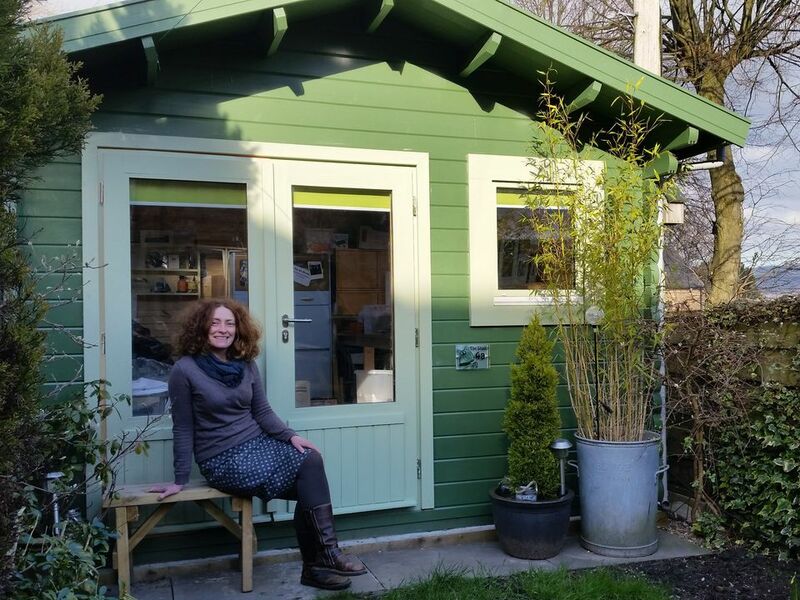 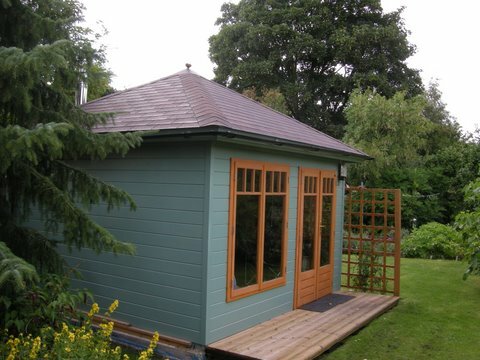 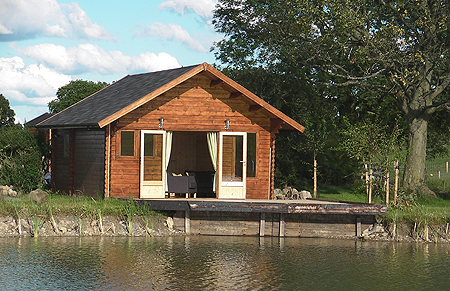 All of the cabins have aluminium doors and PVC-U sash box windows in anthracite grey.